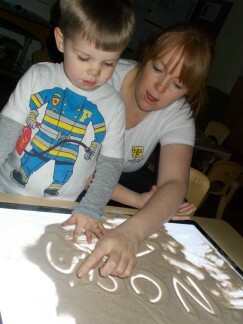 Pre-school have been learning about people who help us. 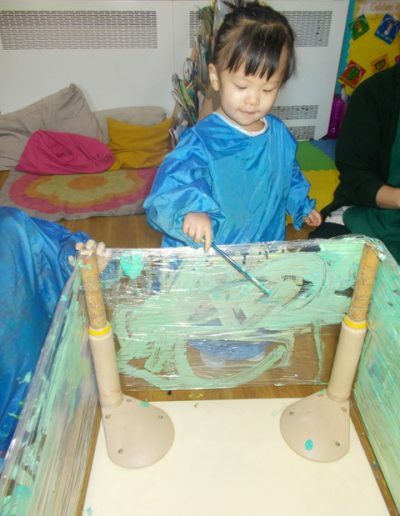 They’ve enjoyed painting their own interpretations of emergency vehicles. 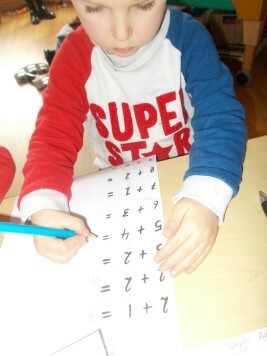 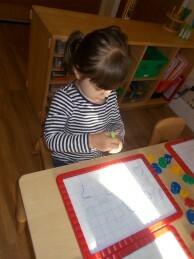 Pre-school have been doing some simple addition sums. 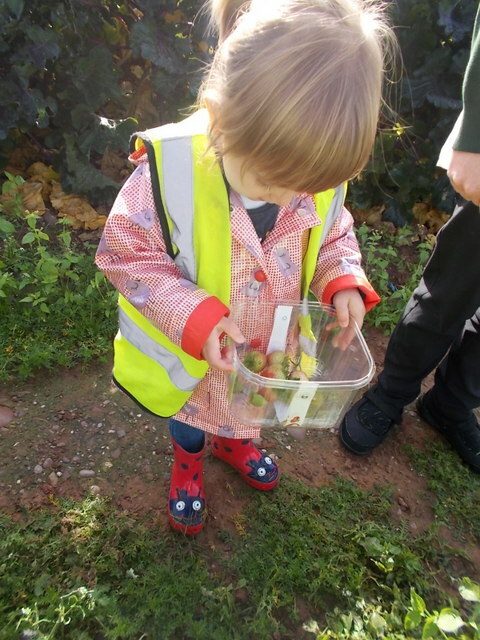 Well done Pre-school! 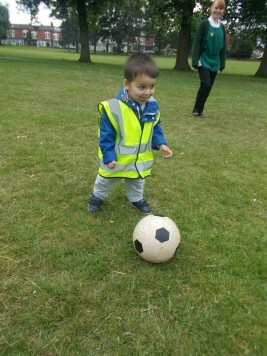 Pre-school love joining in with Coach Lee’s football lessons! 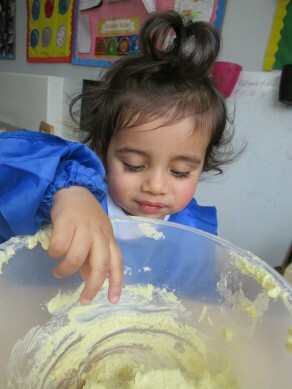 The babies have been making Valentines day biscuits for their families. 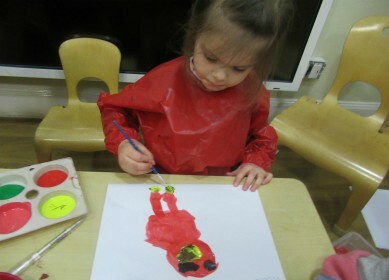 The pre-school children have been creating pigs to celebrate Chinese New Year! 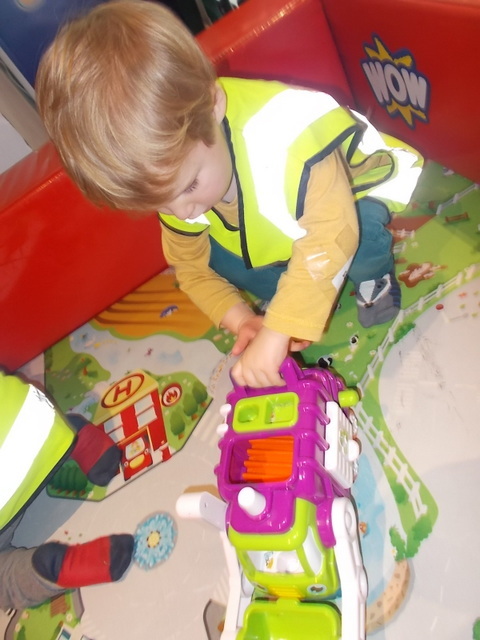 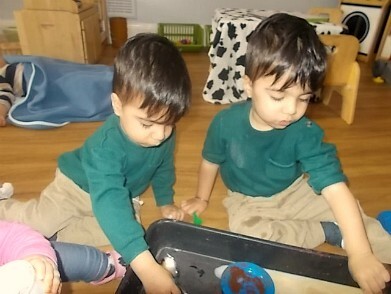 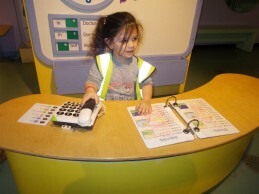 Our babies have really enjoyed exploring their new role-play toys. 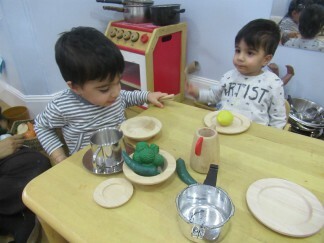 They have been making ‘tea’ and having lunch at the table. 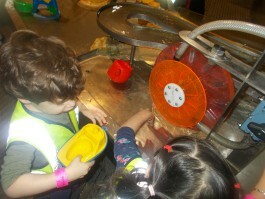 This encouraged lots of babbling, speech and learning new words. 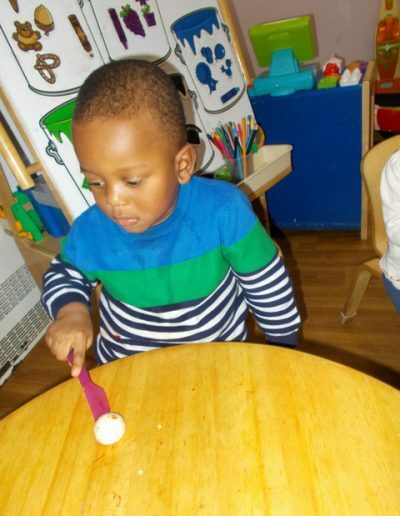 Independence is encouraged in all ages at Norfolk House and as you can see the babies have lots of fun serving their own foods! 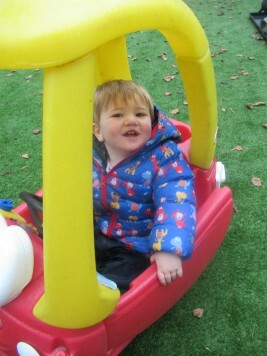 Some of our older babies have enjoyed outdoor play! 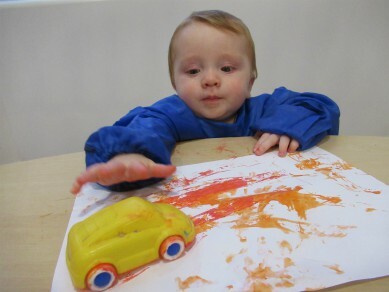 Some of our younger babies have enjoyed making marks using the cars! 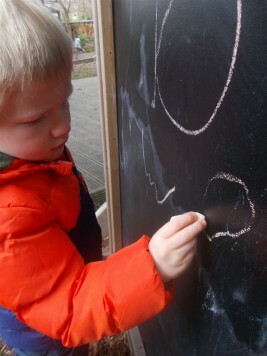 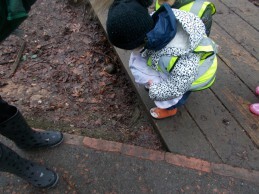 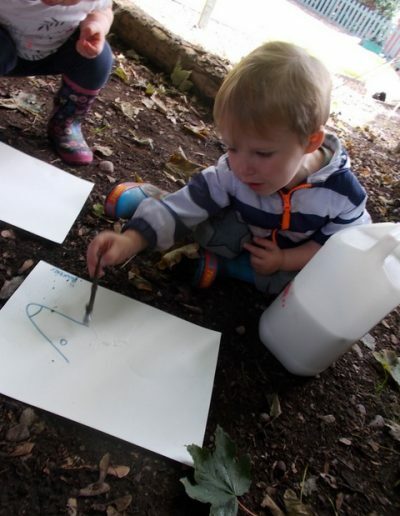 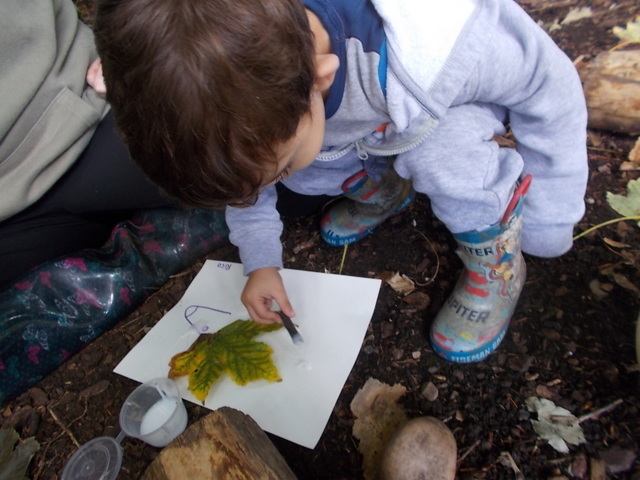 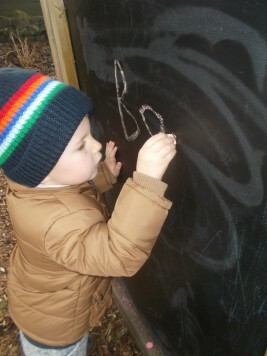 The Pre-school children have been practicing their mark making and writing skills by using chalks outdoors. 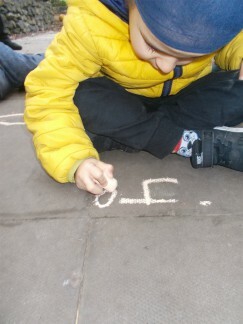 They have been writing their names and simple words too. 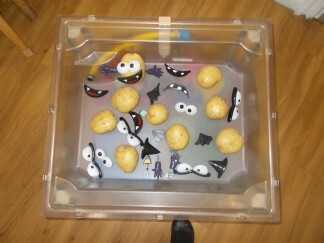 The Toddlers have been exploring a Dinosaur World, making porridge for the three bears and creating their own potato heads in the water tray! 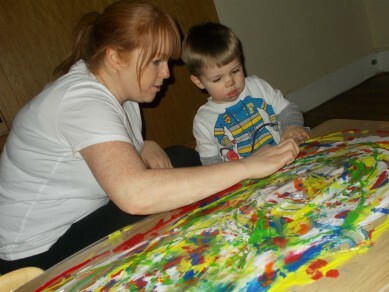 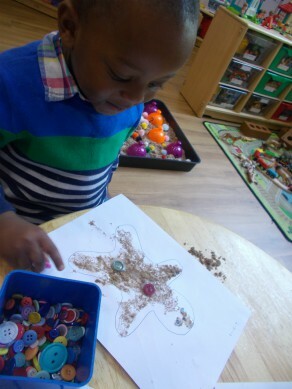 Our parents and their children had lots of fun at their mark-making stay and play! Thank you to the parent’s that attend. 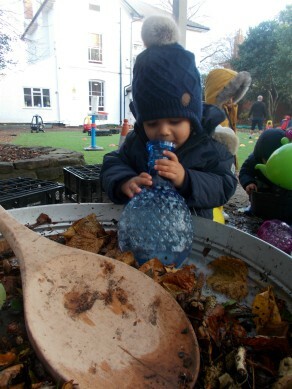 The babies have enjoyed using natural resources and water to create their own ‘potions’ outdoors. 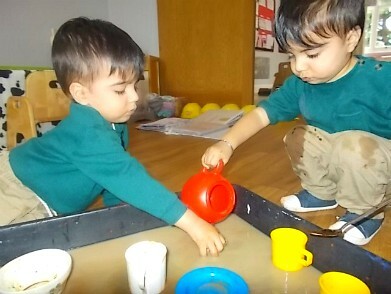 The Babies have enjoyed the sensory experience of exploring coffee beans and teabags to make their own ‘drinks’. 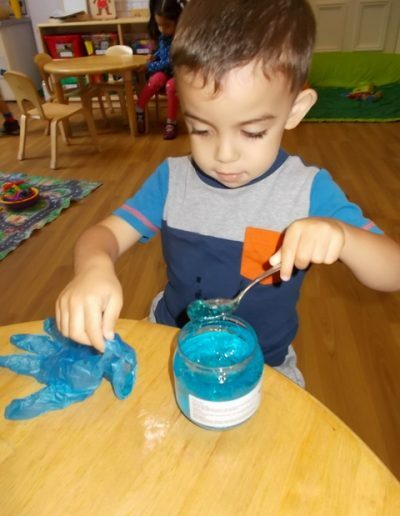 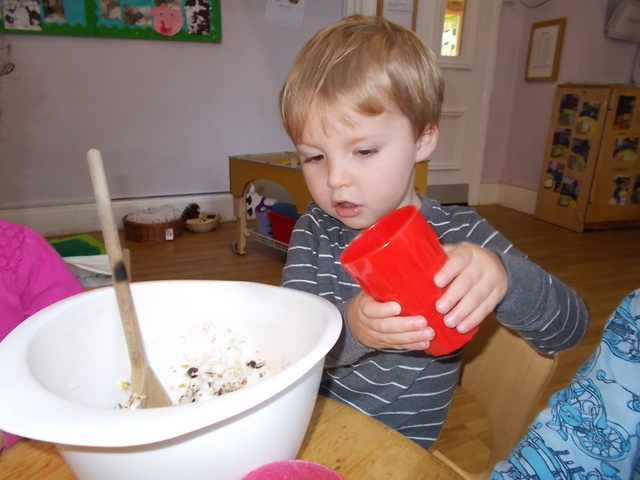 They enjoyed mixing, pouring and filling and it was a great way of promoting their communication and supporting their relationships with peers. 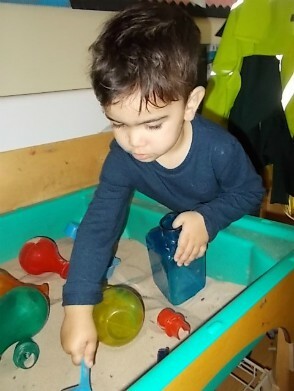 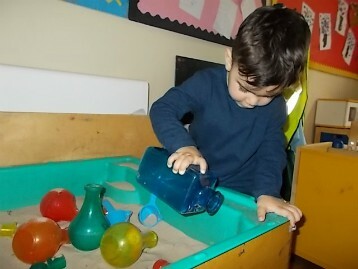 Pre-school have enjoyed emptying and filling using sand. 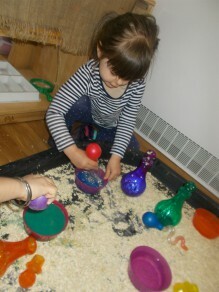 They made their own ‘potions’ and explored capacity and new language. 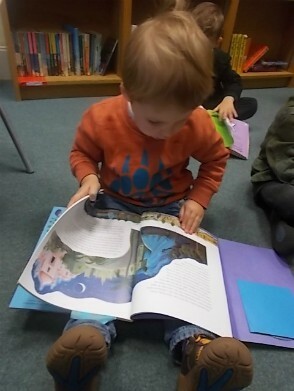 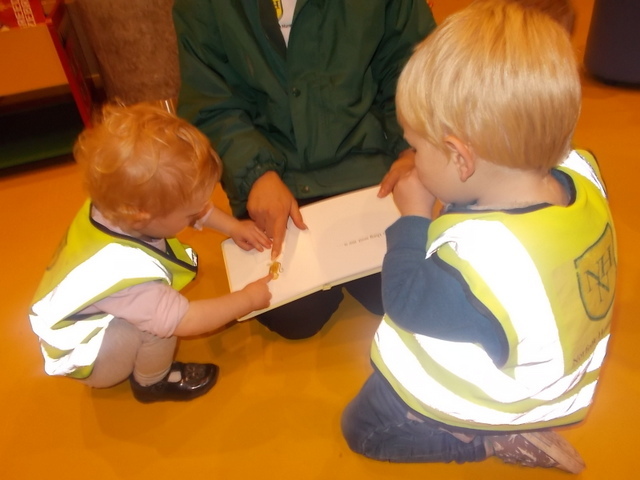 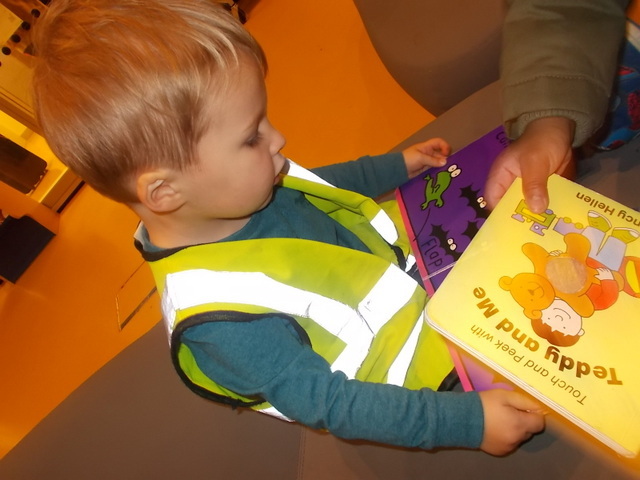 Pre-school enjoy their visit to the School Library every Friday morning. 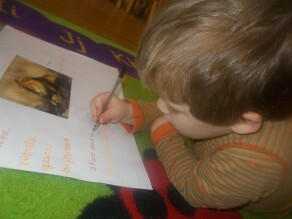 They enjoyed reading some stories and then creating their own book reviews. 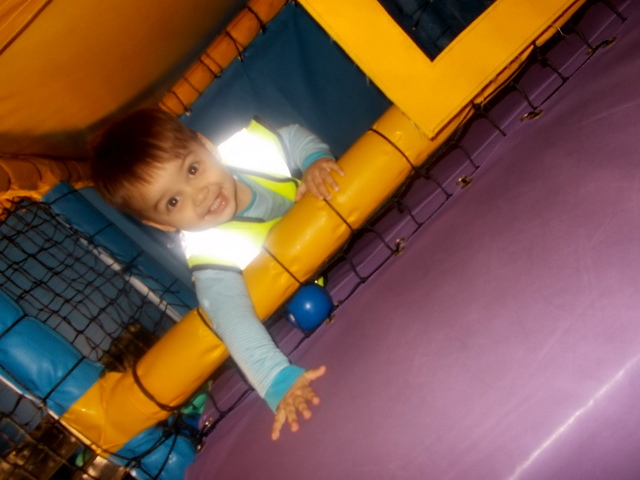 Pre-school had lots of fun exploring their new ball pit. 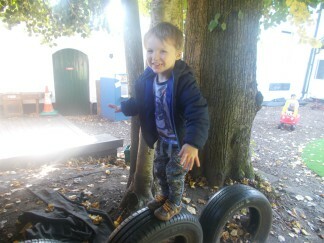 They also practiced their balancing and jumping skills on tyres! 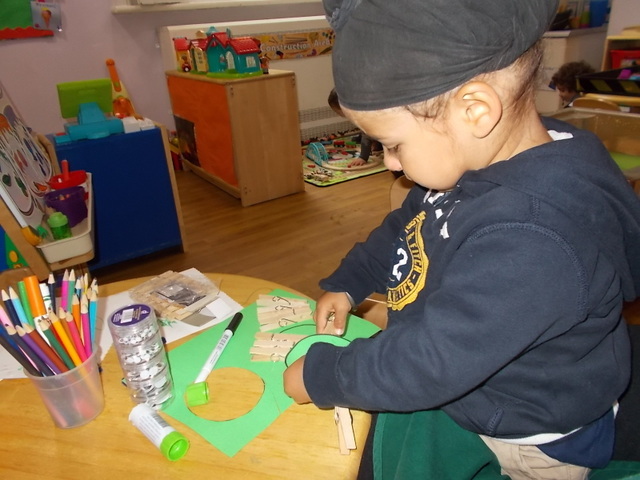 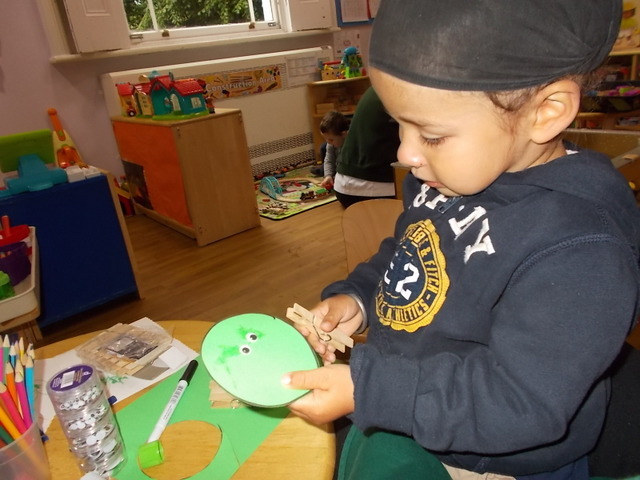 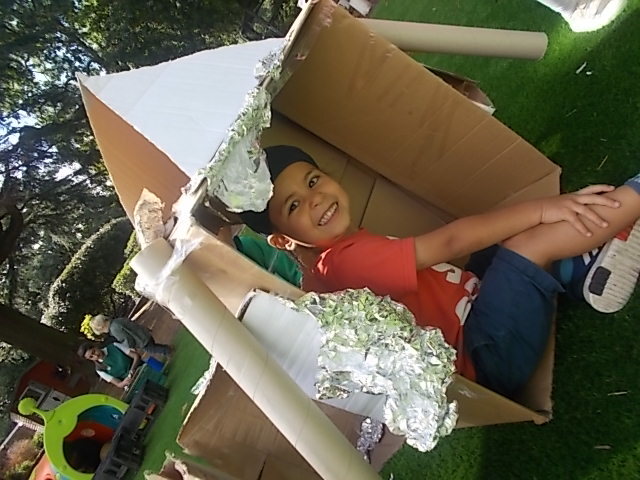 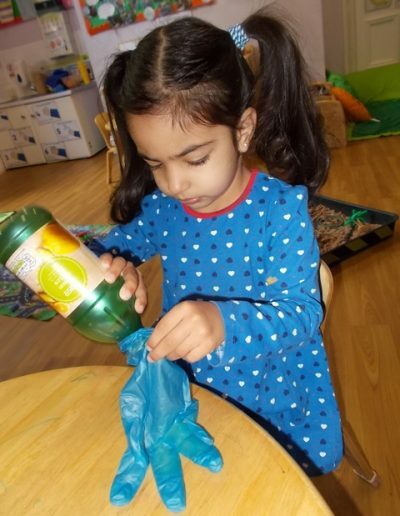 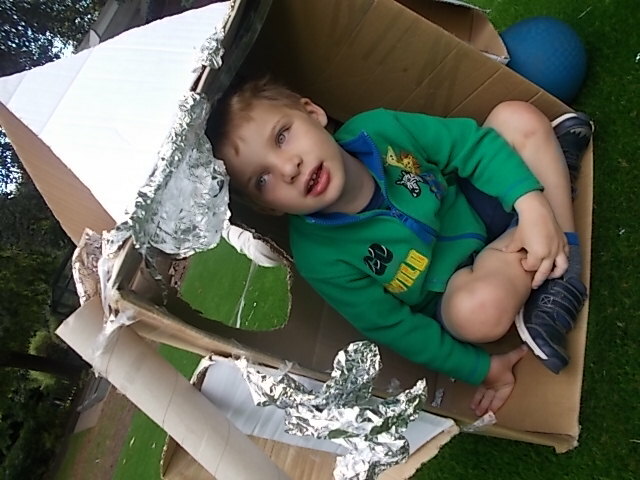 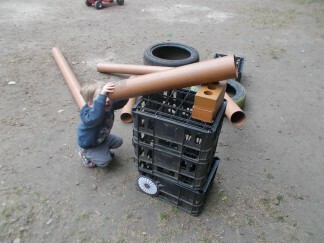 The children in Pre-school really enjoyed creating their own ‘Rocket’ using Junk Modeling. 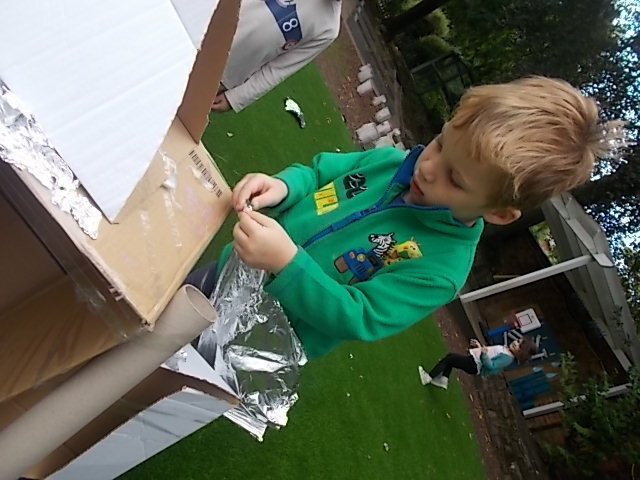 They used various resources and worked in a group before going on a Space Adventure! 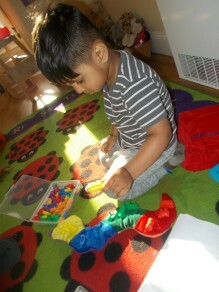 The Pre-school children have been practicing their counting skills and making marks to represent numbers. 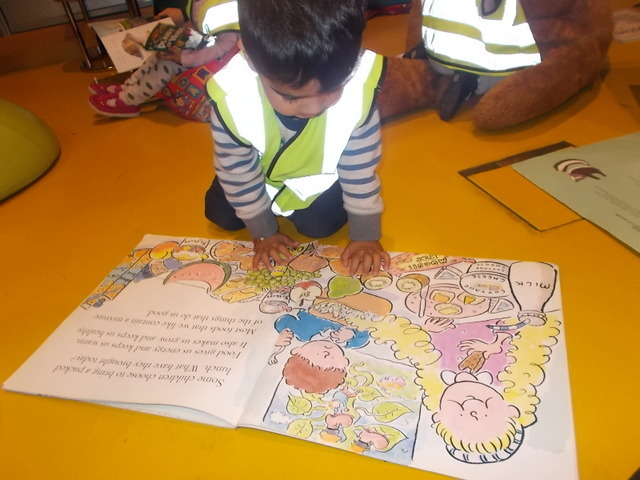 The Toddlers have really enjoyed ‘The Gingerbread Man’ story. 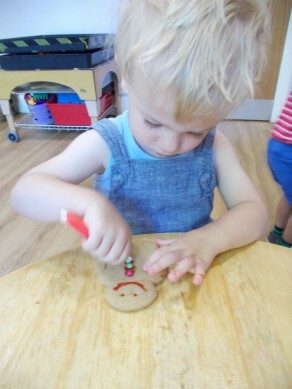 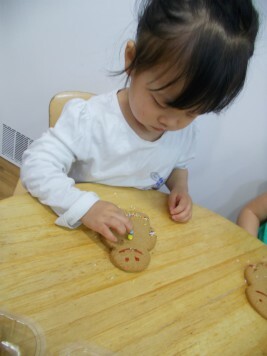 They have taken part in lots of related activities and particularly enjoyed decorating their own Gingerbread men using sand and buttons! 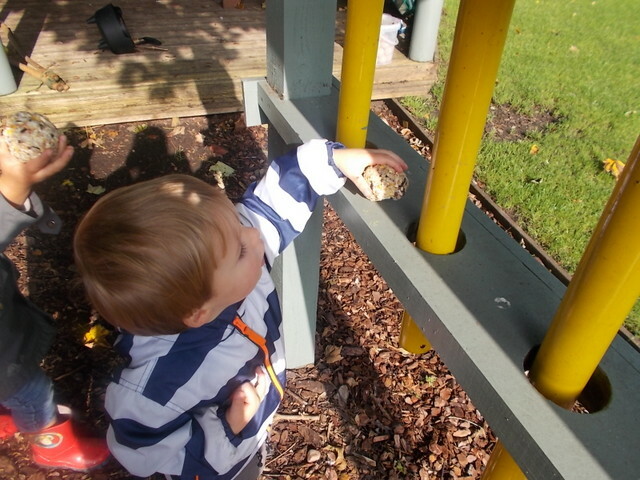 The Toddlers have enjoyed singing ‘5 Little Speckled Frogs’. 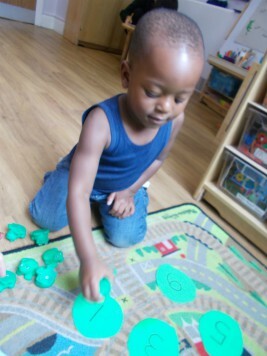 We used this interest to explore number recognition and counting and the Toddlers were able to count out the correct number of frogs for each Lilypad. 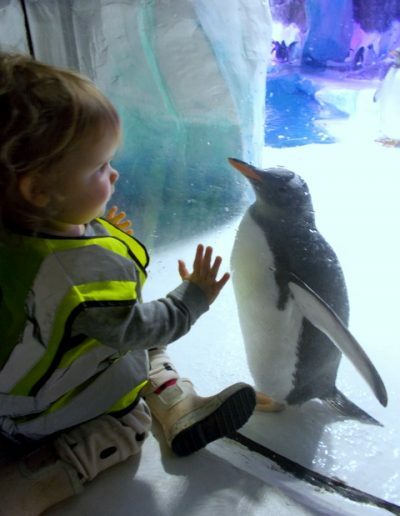 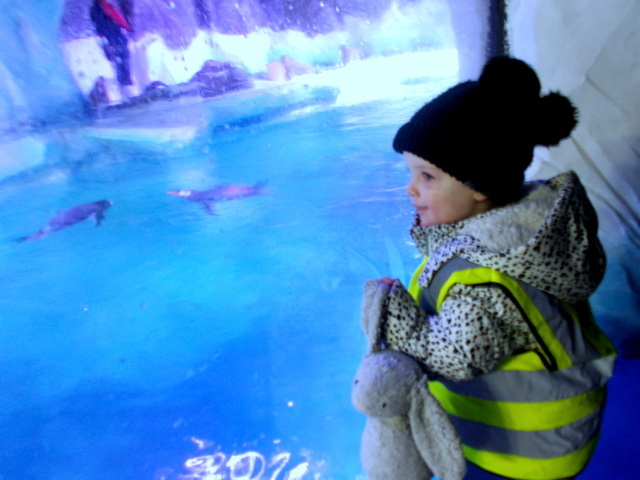 The babies had lots of fun exploring ice and splashing! 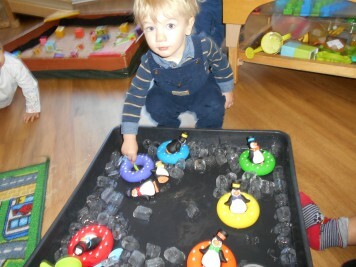 Lots of language was used and they even attempted to match the penguins to the correct coloured rings! 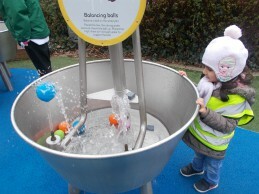 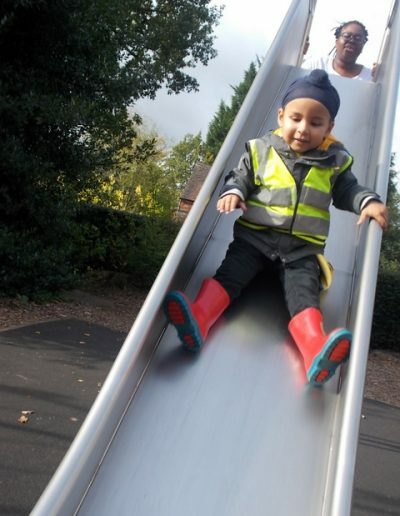 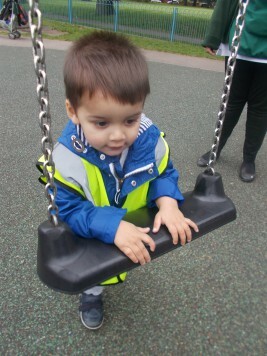 The toddlers had lots of fun going on a trip to the local park. 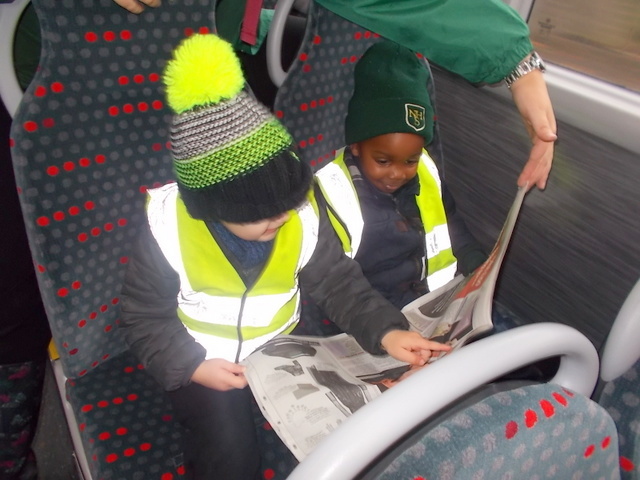 They travelled by bus and had a picnic. 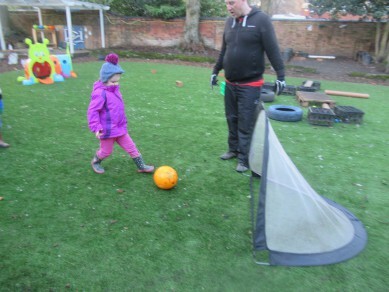 They explored in the playground and practiced gross motor skills with the football. 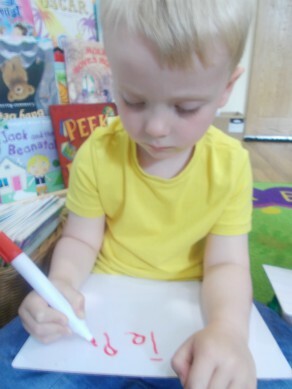 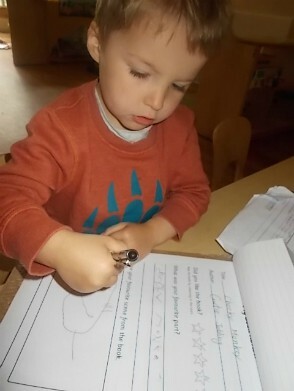 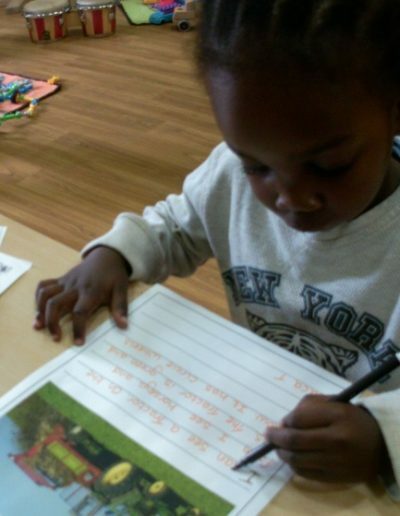 The Pre-school children have been practicing their writing. 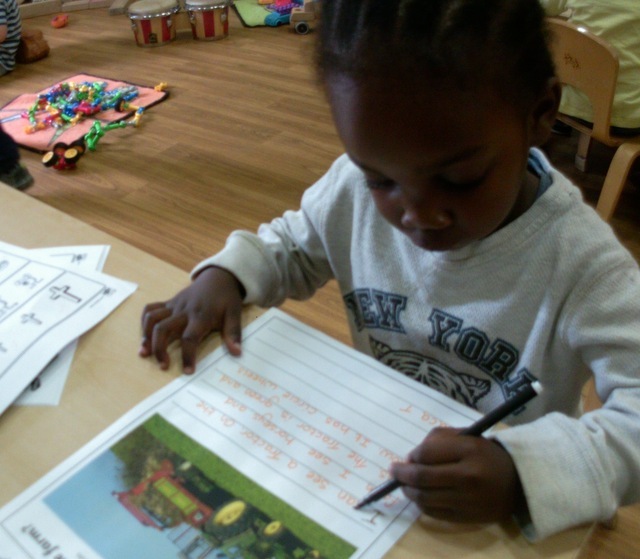 Some of our children were able to listen to the sounds in words and write them independently. 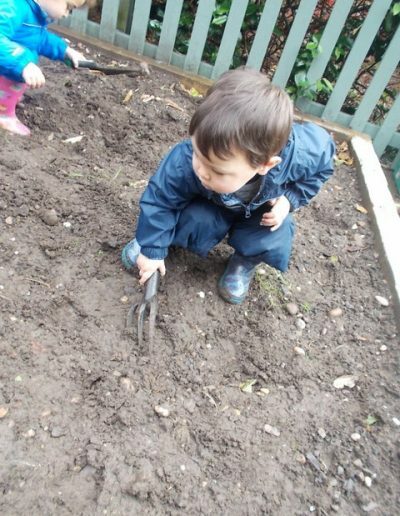 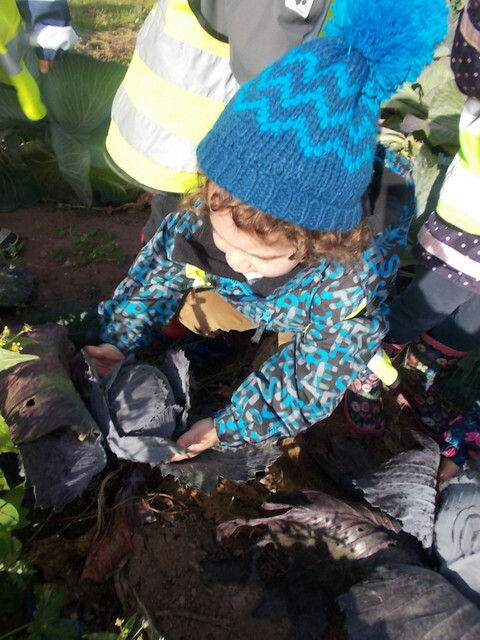 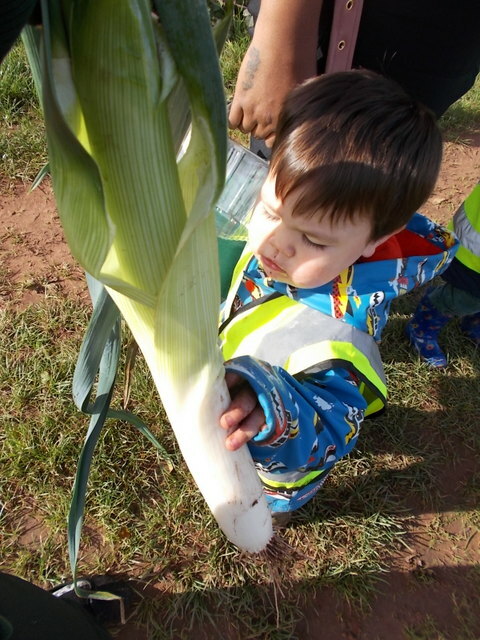 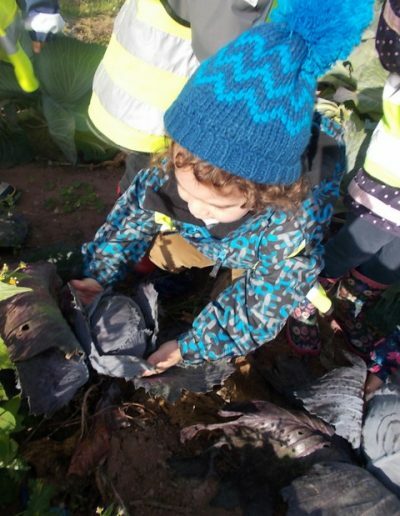 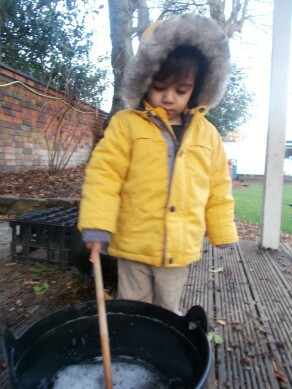 The Pre-school children have had lots of fun exploring in the garden with loose materials. 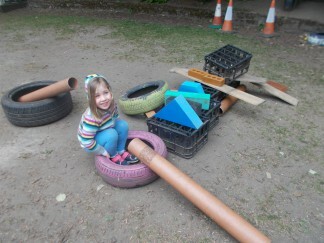 They built their own ‘obstacle course’ and then even added their own ‘telescope’. 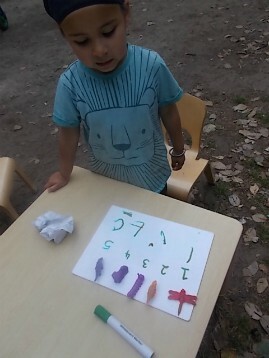 Pre-school have been practicing their number recognition and writing skills. 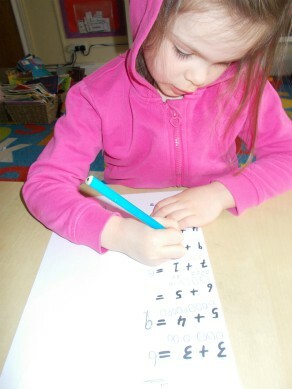 They used whiteboard pens to copy a variety of numbers. 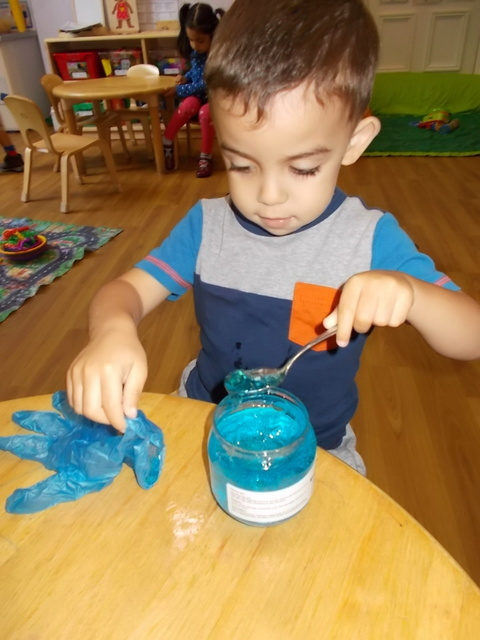 We have been practicing our pre-writing skills and shape recognition by mark-making different shapes in flour using our fingers. 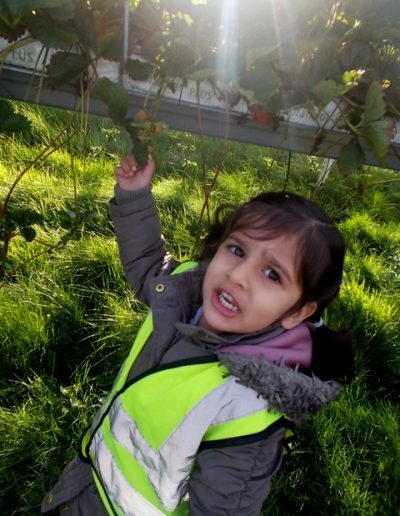 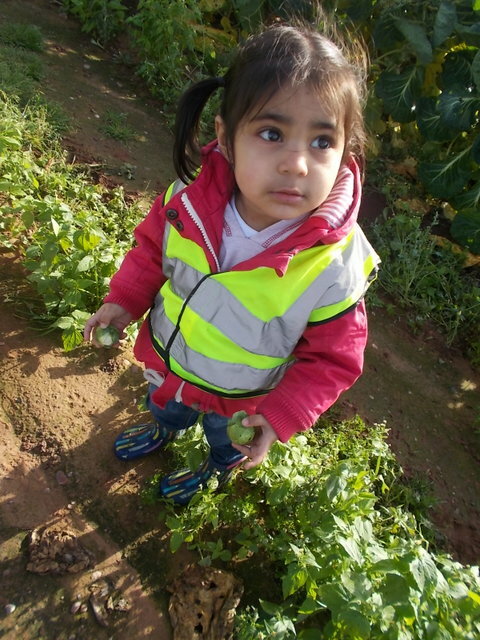 The babies had had lots of fun exploring different type of fruit. 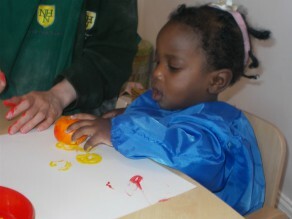 They took part in fruit tasting and they made their own pictures using pieces of fruit. 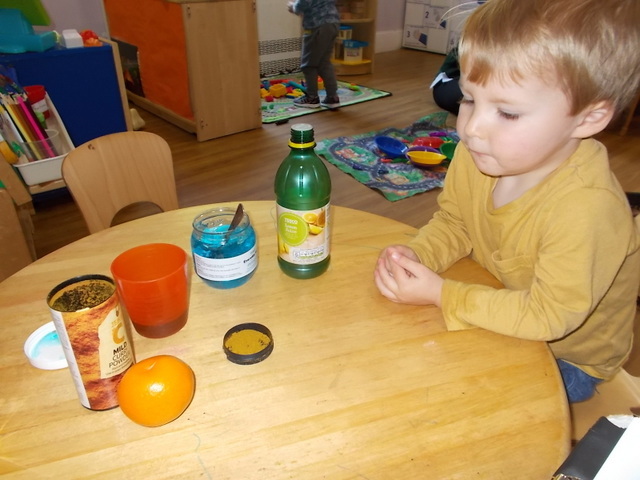 Pre-school had lots of fun making their own ‘potions’. 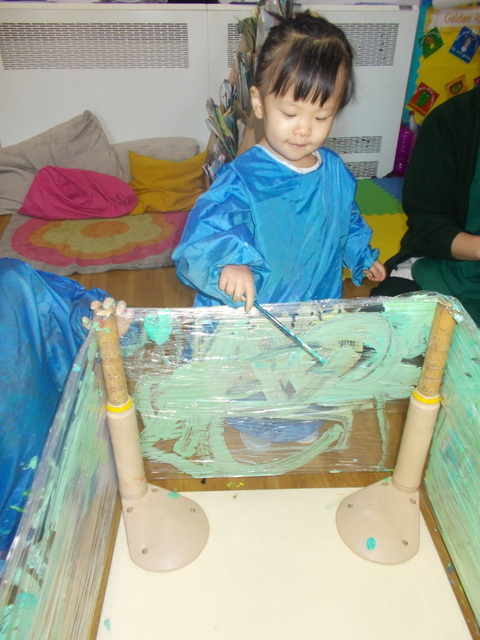 They used their imagination to create different ‘spells’. 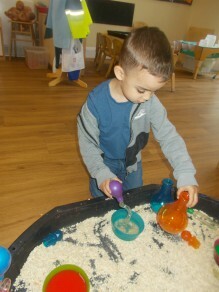 They used pipettes to transfer a variety of different coloured water and watched as the colours mixed together. 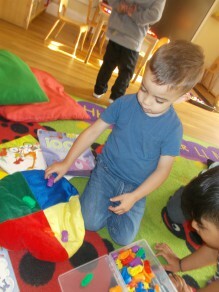 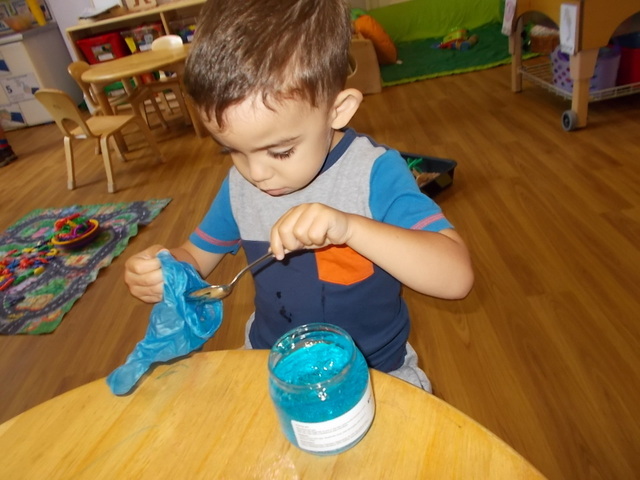 The Pre-school children have been exploring different colours. 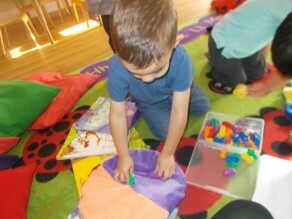 They had lots of fun sorting a variety of animal and transport counters into coloured groups and then matching the colour on the different cushions. 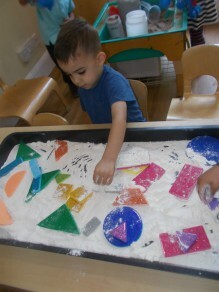 The children made a series of lines and traced shapes in sand using their fingers to practice their fine motor skills. 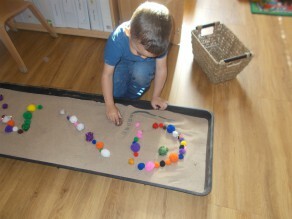 They also copied the shapes using pom poms. 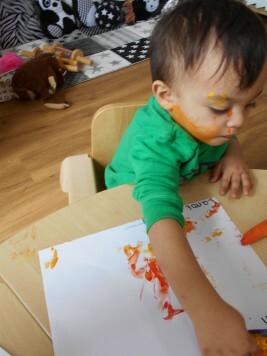 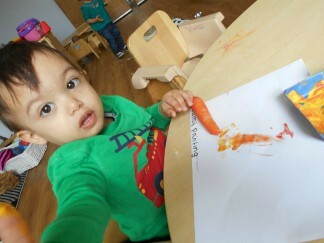 Babies 2 explored different ways of making marks and they used carrots to paint with! 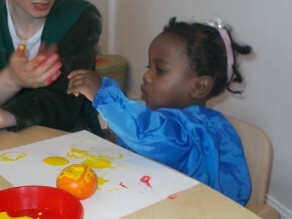 They had lots of fun and enjoyed painting their faces too! 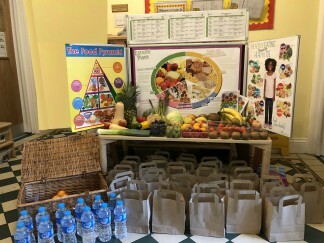 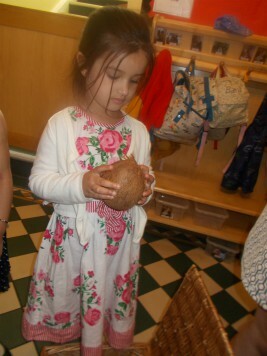 Our health visitor visited the nursery on 8th May to deliver a ‘Healthy Eating’ workshop to our parents and children. 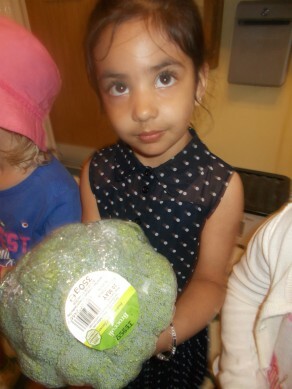 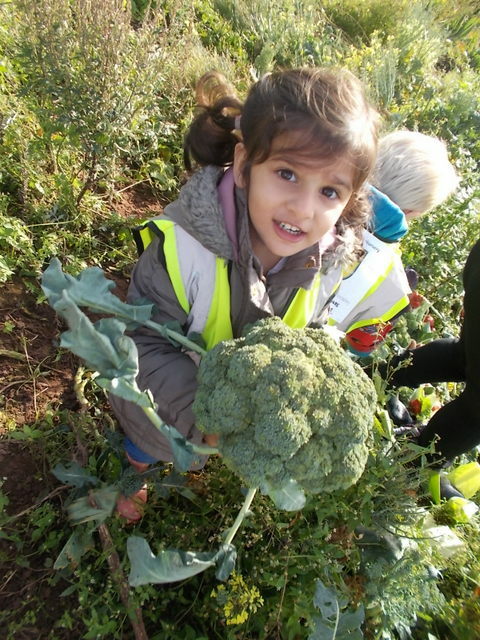 The children took it in turns to explore different fruit and vegetables and learn about healthy eating. 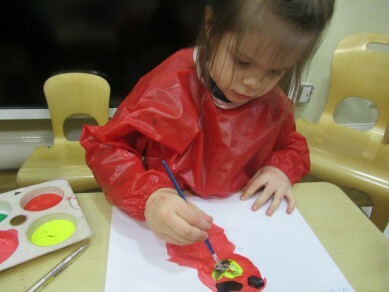 The children have had lots of fun getting messy and creative by painting on cling film! 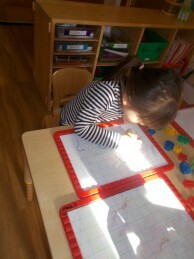 They used their gross motor skills to create a series of lines and circles. 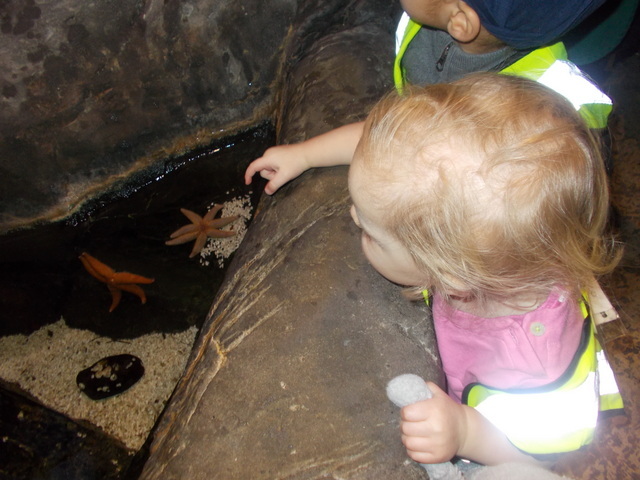 We had lots of fun travelling by bus to the Sealife Centre! 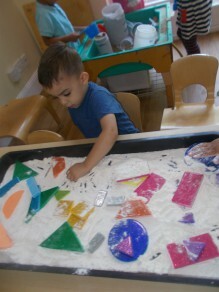 Toddlers especially liked looking at the penguins and came back to nursery to create their own sea creatures. 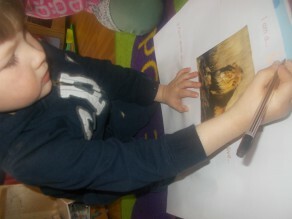 The Pre-school children have been learning about Jungle Animals. 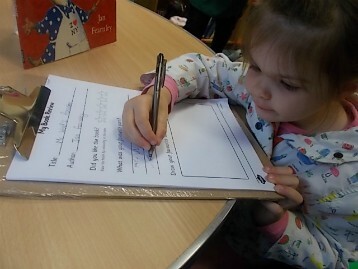 They researched some facts on the laptop and wrote them down on their own fact files. 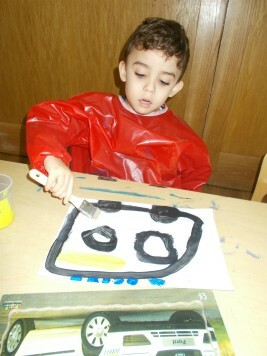 They also painted their own representation of each animal. 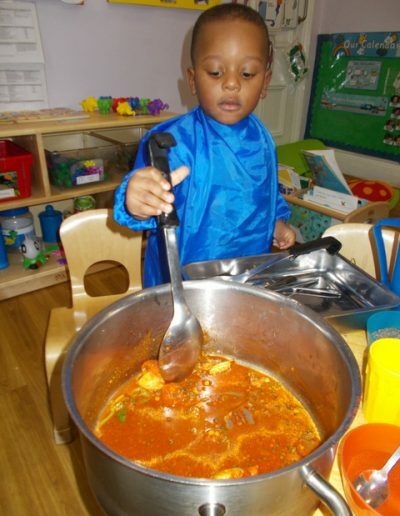 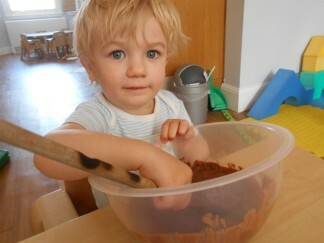 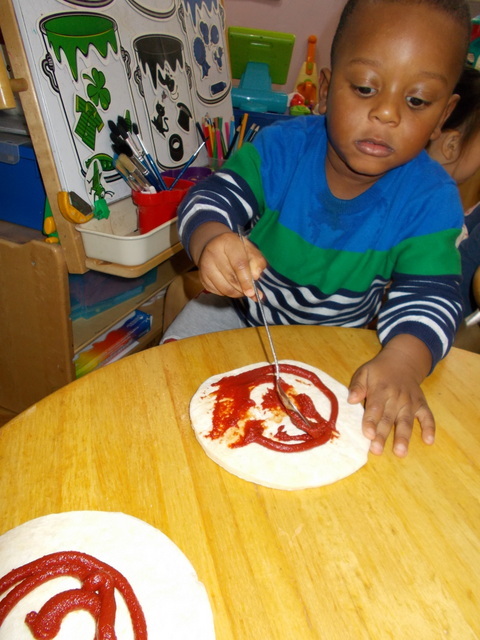 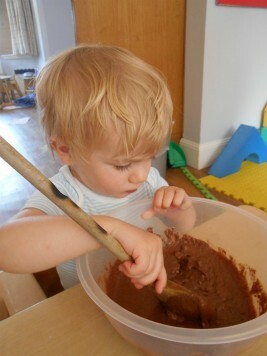 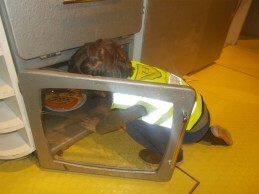 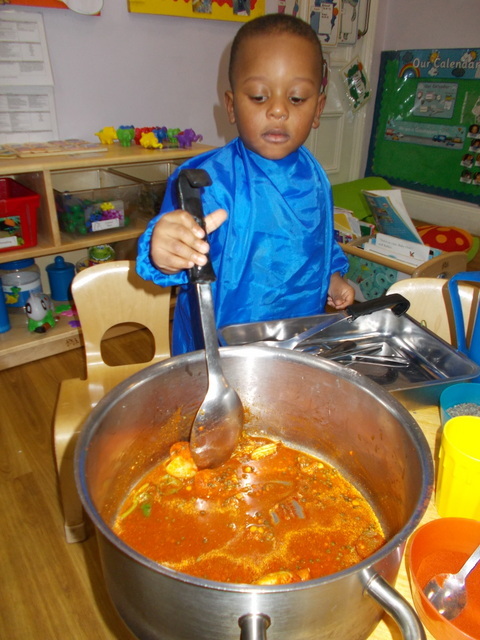 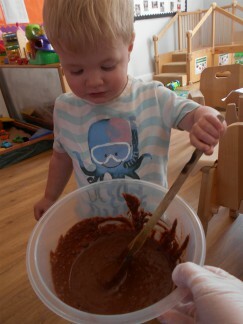 Toddlers have really enjoyed taking part in various cooking activities. 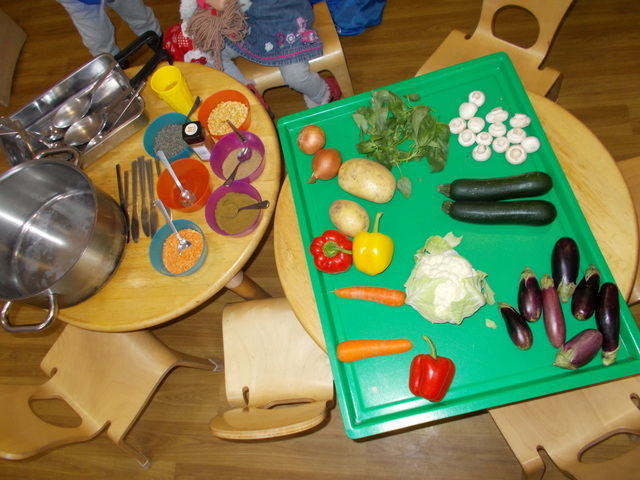 They have been exploring lots of different vegetables, practicing their cutting skills and making pizza/stew. 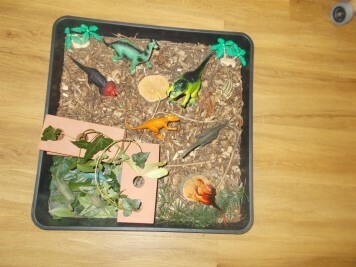 We have been learning about big and small using our interest in Dinosaurs. We used our hands to dig for Dinosaur bones in the sand and sorted them into different piles. 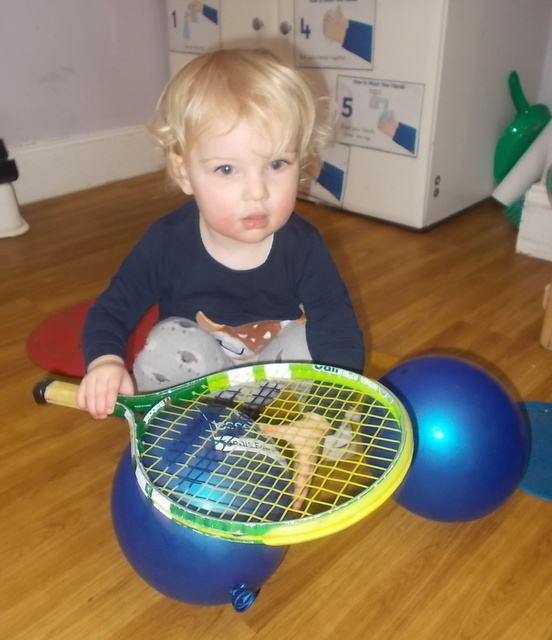 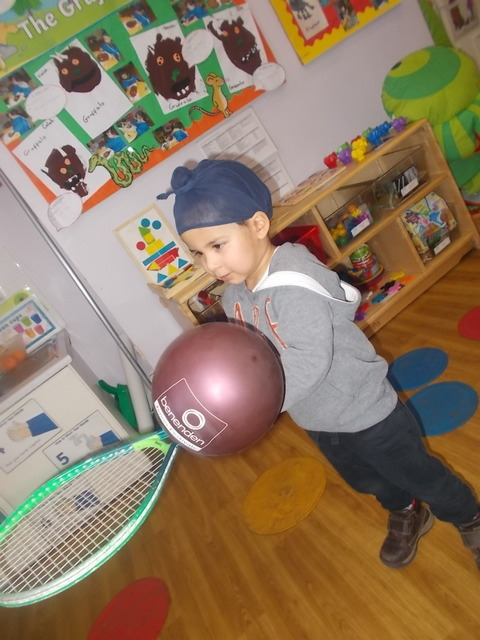 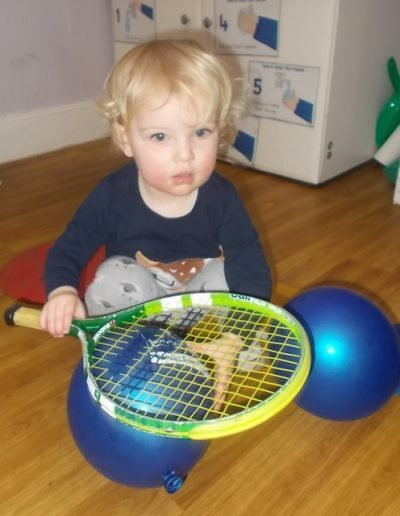 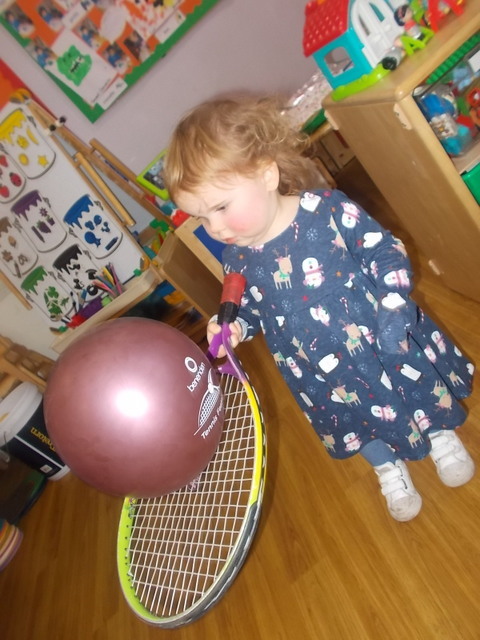 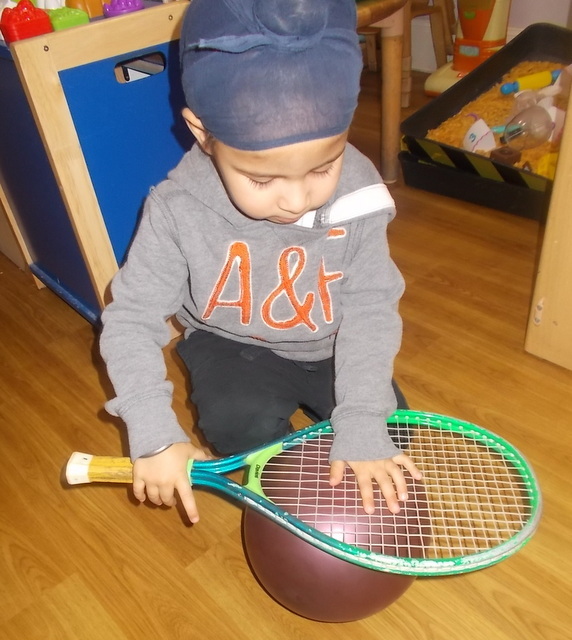 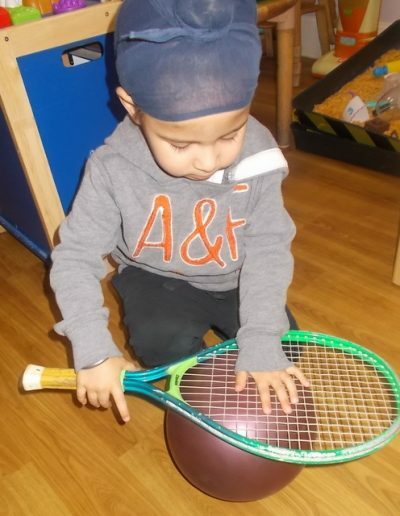 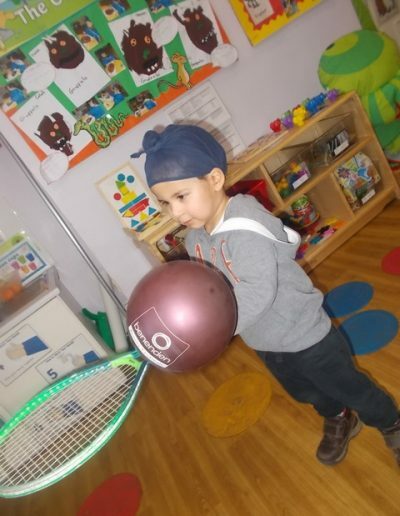 The Toddler and Pre-school children join in with ‘Toddler Tennis’ on a Tuesday. 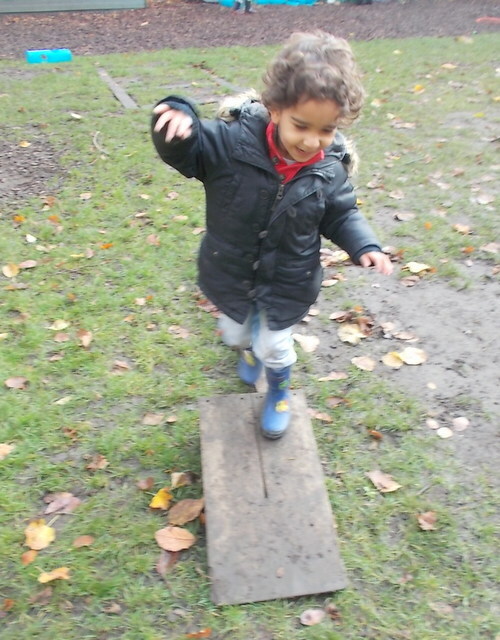 They have lots of fun practicing their physical skills in line with the EYFS requirements. 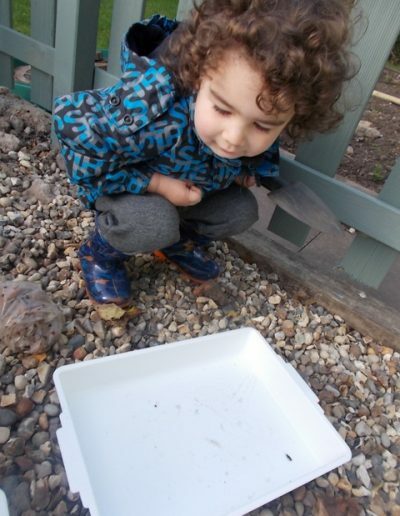 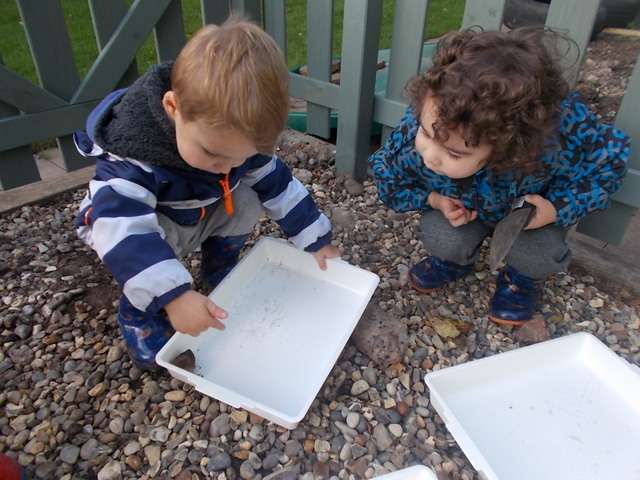 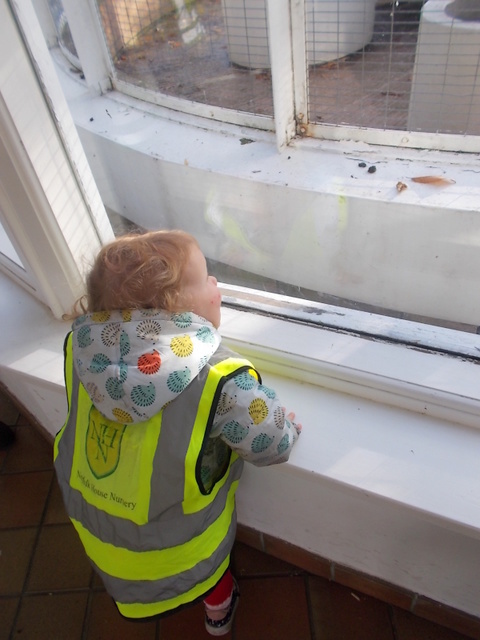 Toddlers have been practicing their counting through their interest of Mini-beasts. 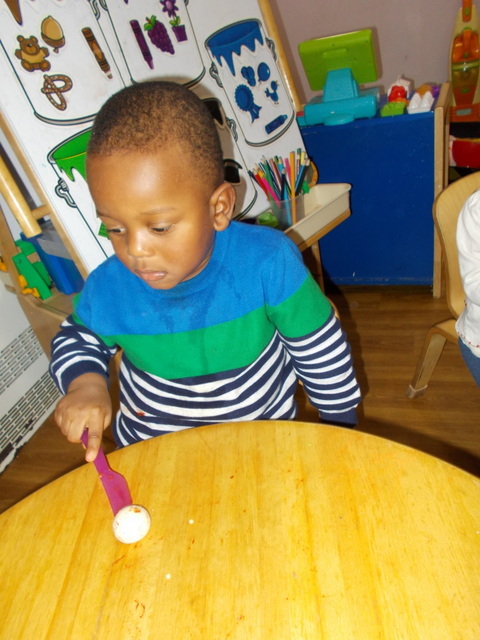 They used pegs to develop their fine motor skills, putting them on to their spider and counting as they did this. 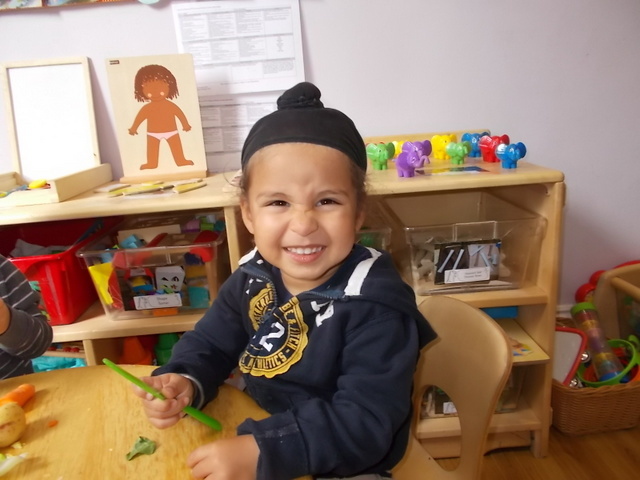 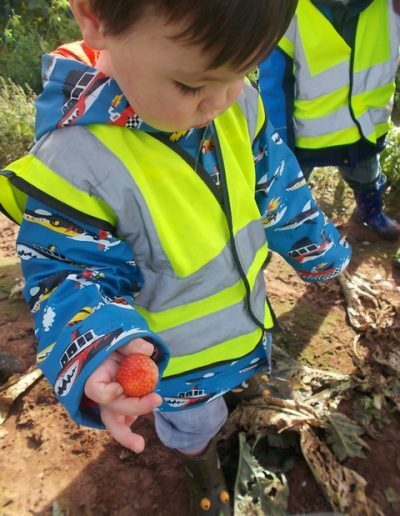 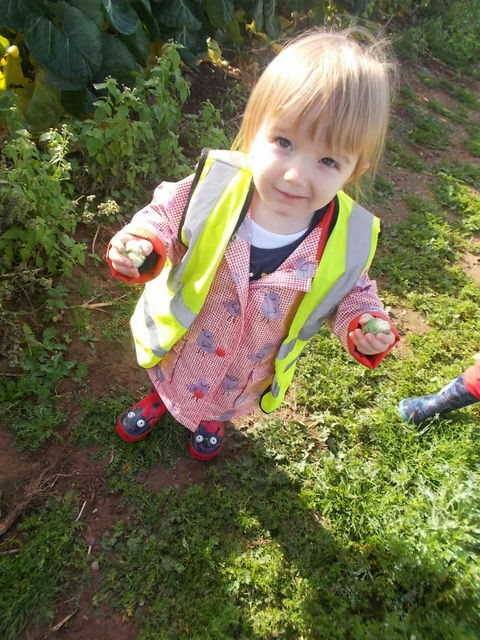 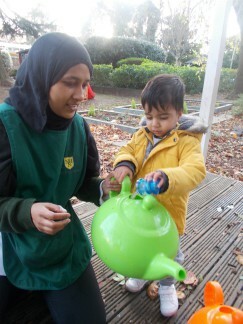 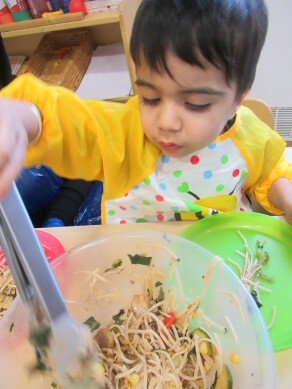 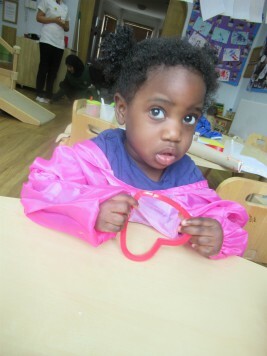 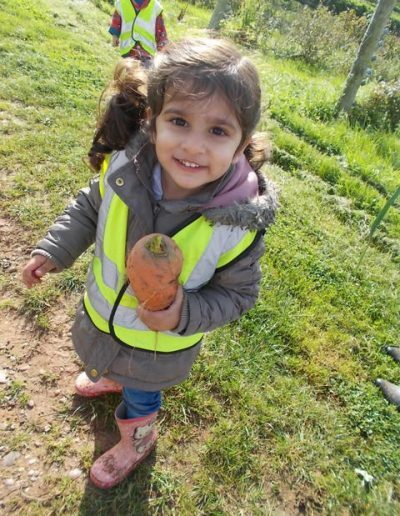 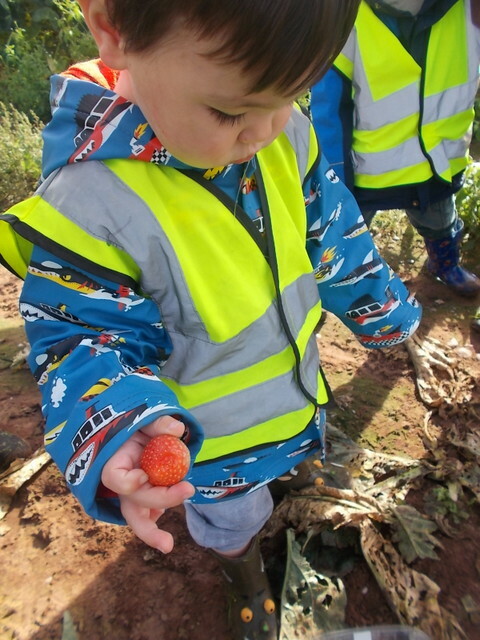 Toddlers enjoyed exploring different Salad items and vegetables and learning their names. 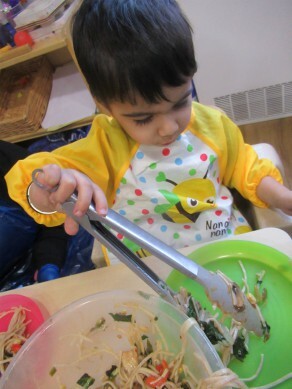 They used knives to cut up Potatoes, Sweet Potatoes, Courgettes and Carrots. 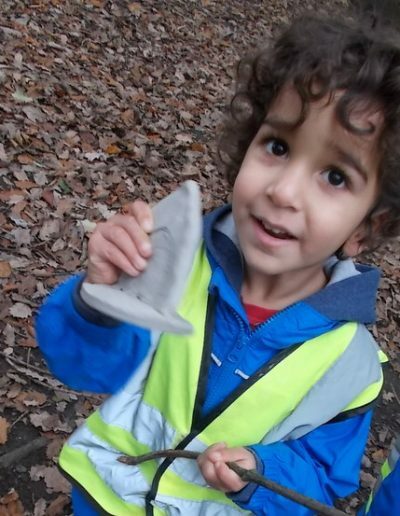 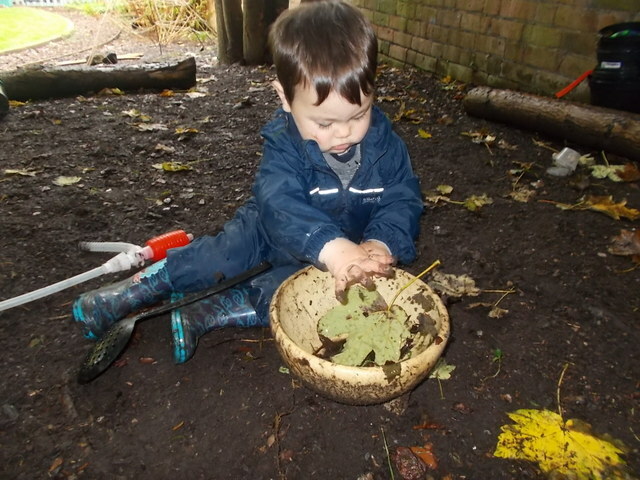 During Forest School the children had lots of fun having snack in their den, exploring nature and making their own leaf hedgehogs. 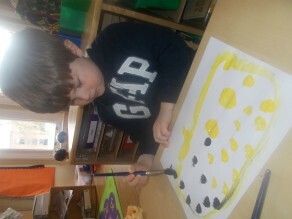 They used natural resources to create their pictures. 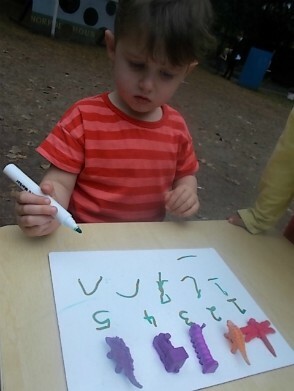 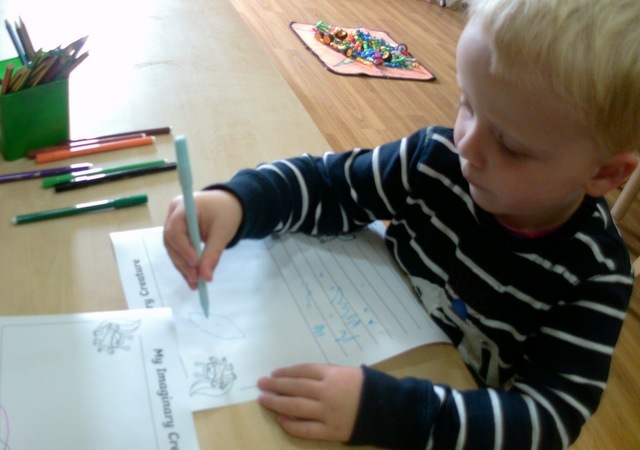 The Pre-school children have been practicing their mark-making and writing skills. 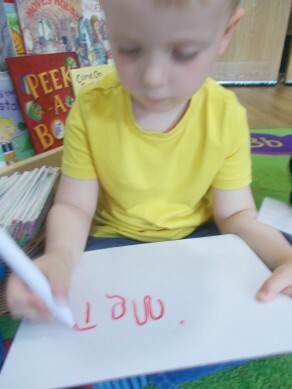 They created a ‘We love writing’ display. 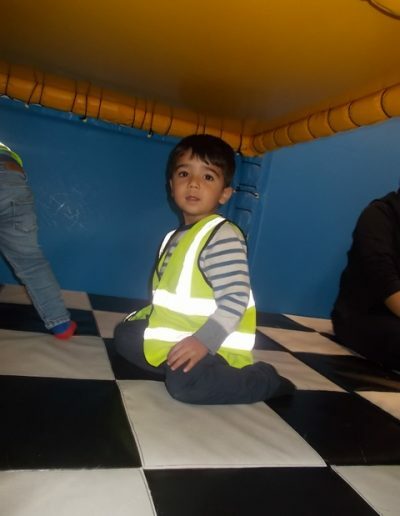 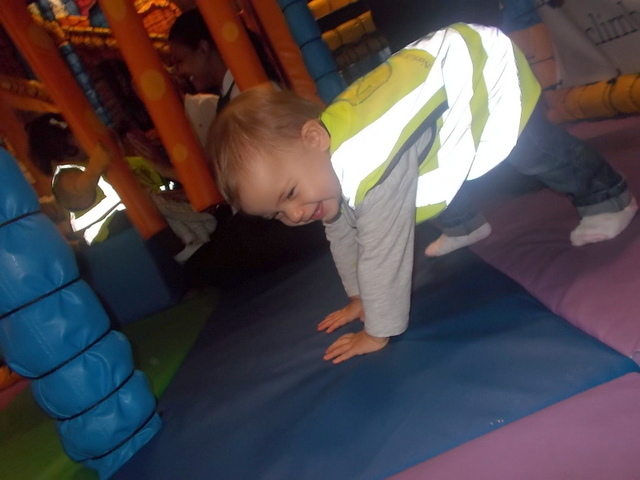 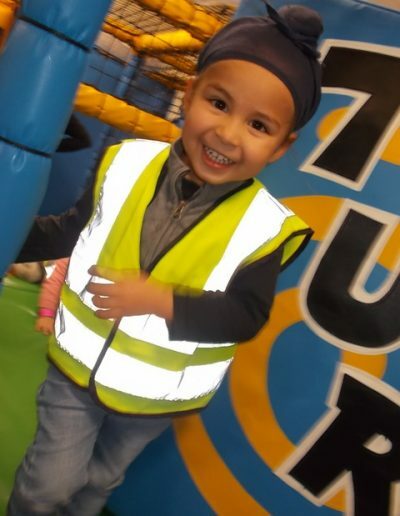 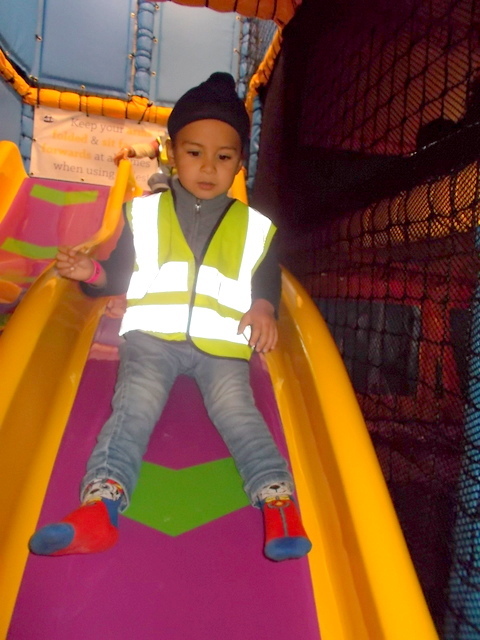 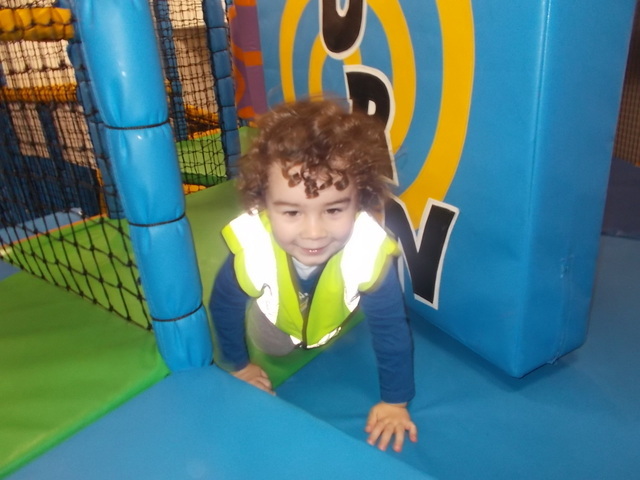 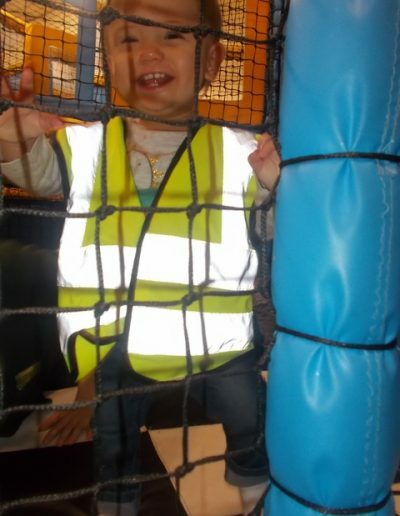 We had lots of fun visiting a soft play area at ‘Rock Up’. 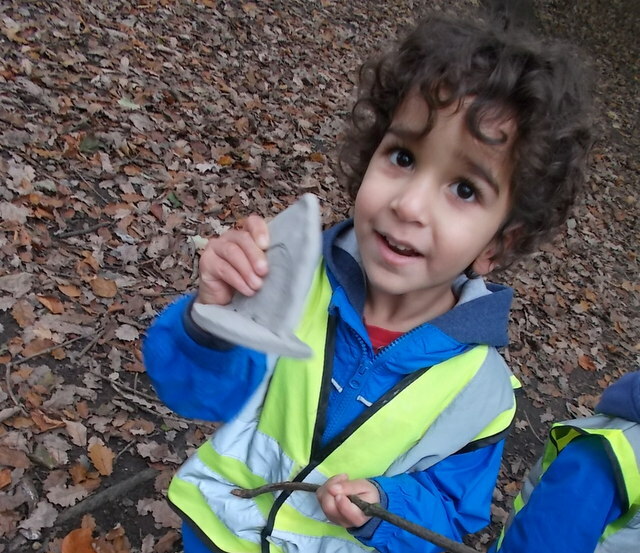 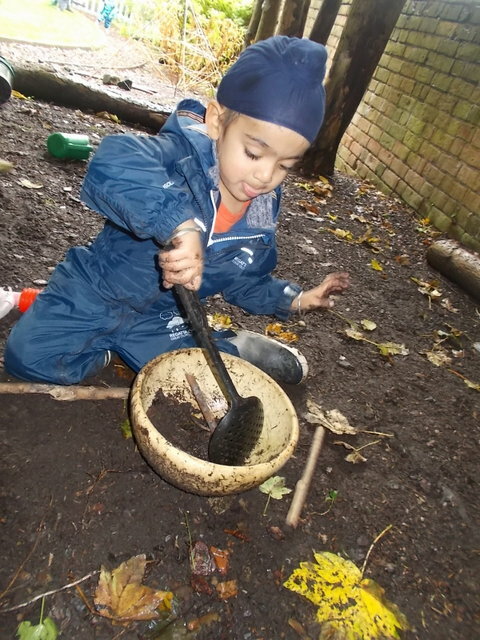 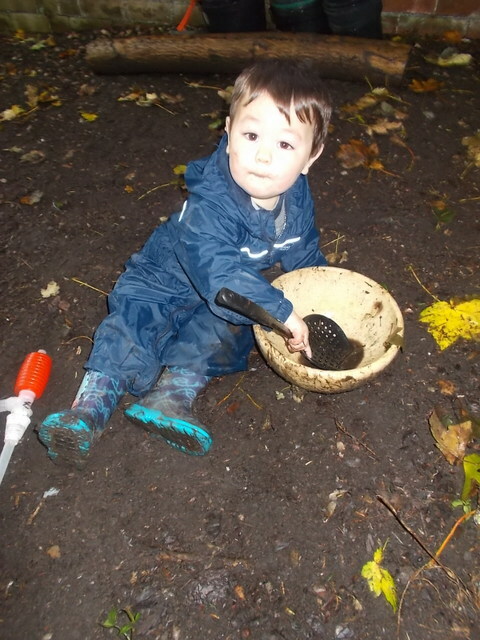 During Forest School, we have had lots of fun getting muddy! 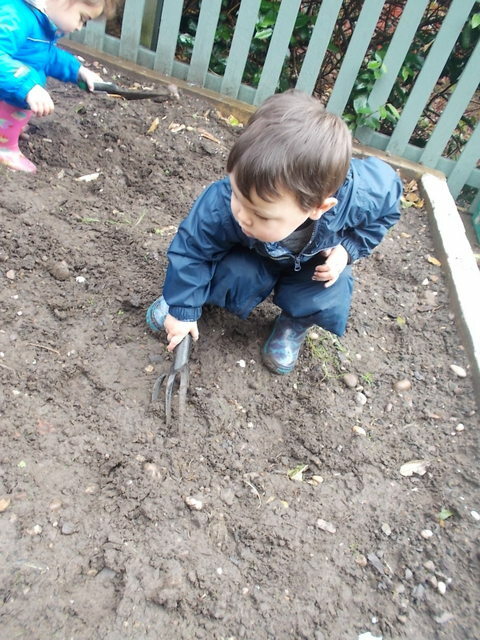 We have been digging for worms and making mud pies with our friends. 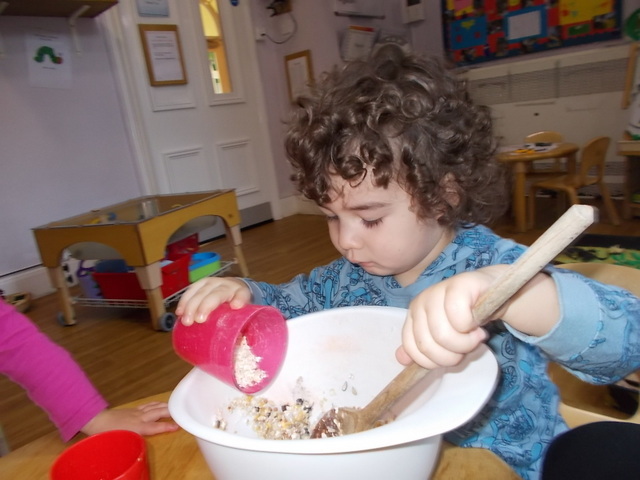 The Toddler children have really enjoyed creating their own ‘Bird Food Balls’. 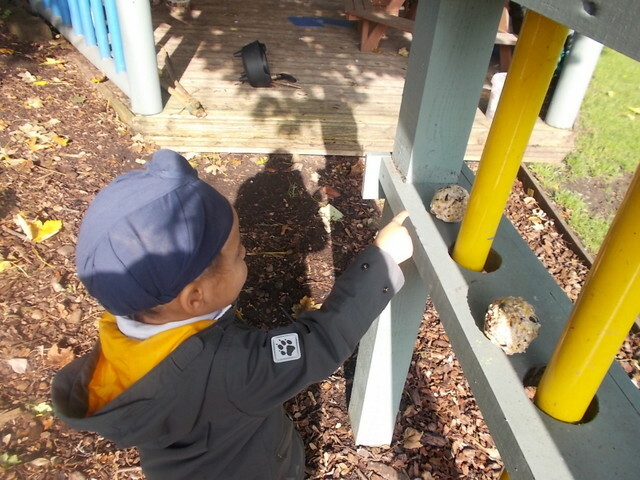 They mixed together Lard, Oats and Raisins and then put them outside for the birds to eat. 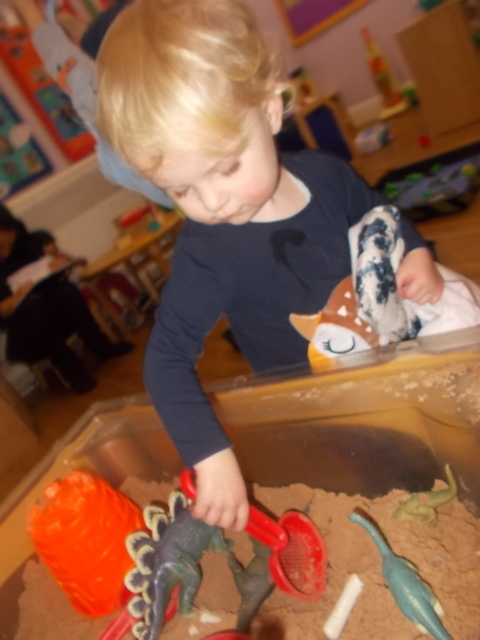 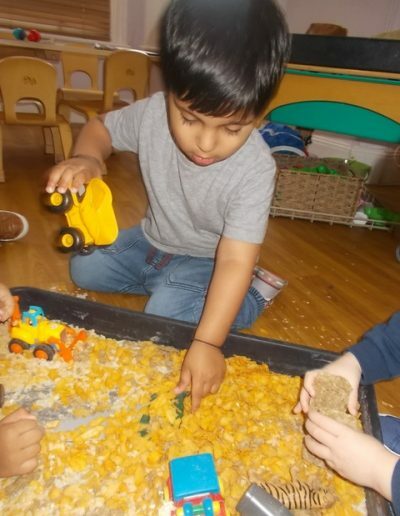 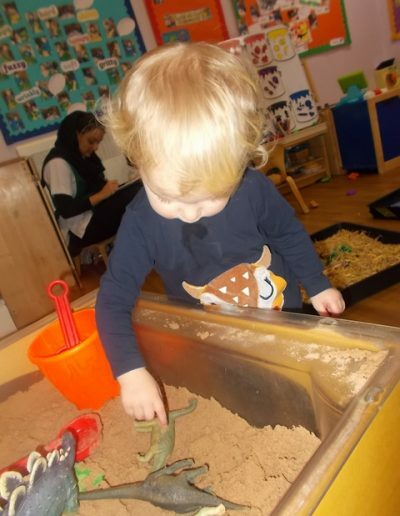 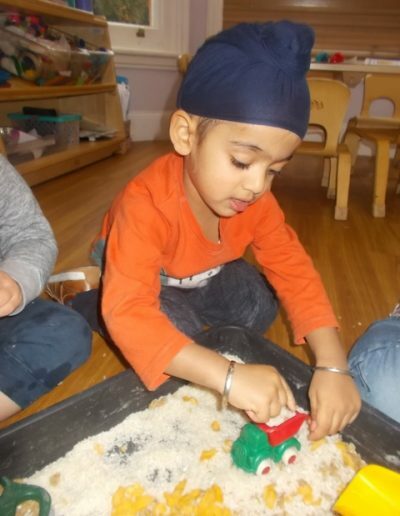 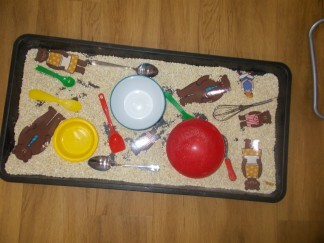 The children in Toddlers helped to make a construction tray, they added lots of different cereal and rice and role-played together with the diggers and tools. 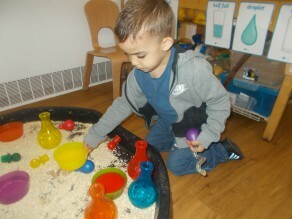 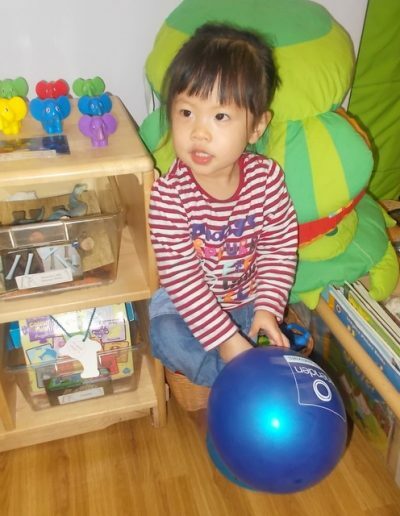 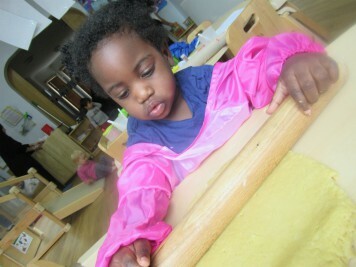 The Toddler children have been exploring their different senses. To support this, they created their own ‘sensory gloves’ by filling up gloves with various different resources. 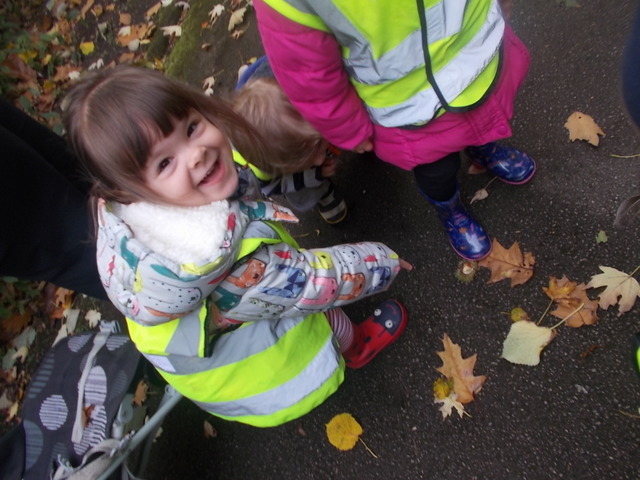 On our Autumn walk, we found lots of leaves and sticks. 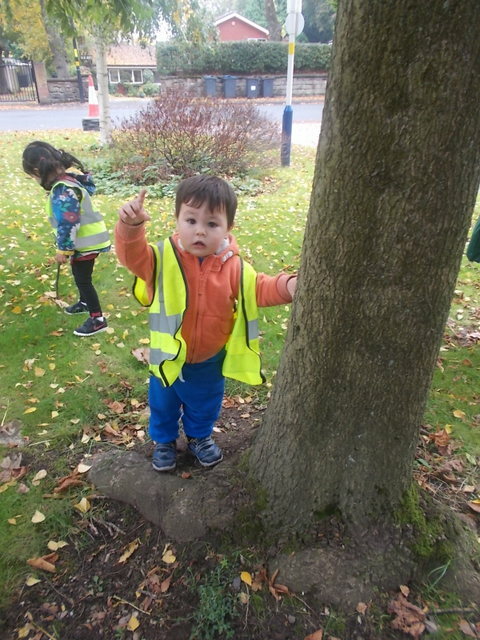 We also looked for birds in the trees! 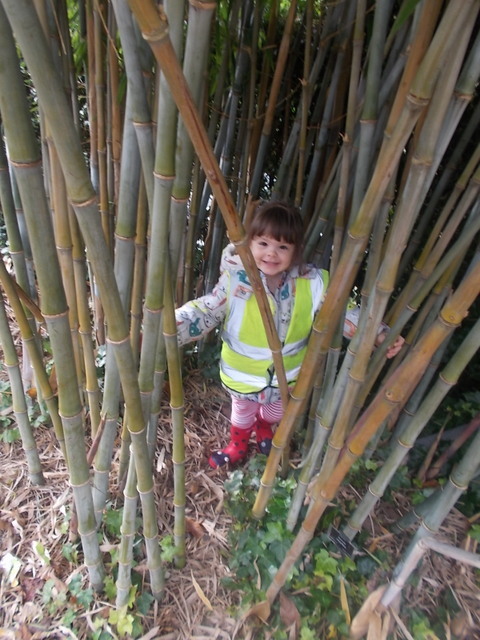 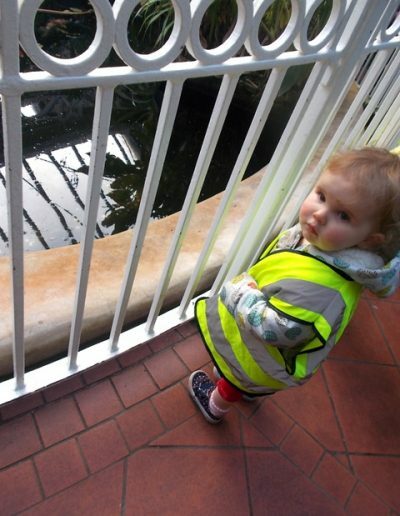 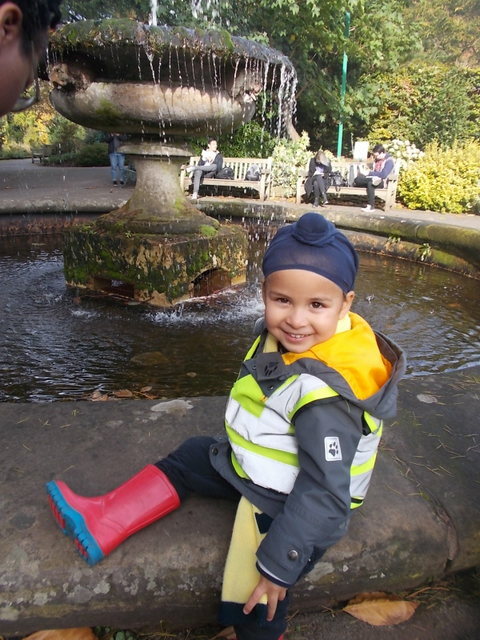 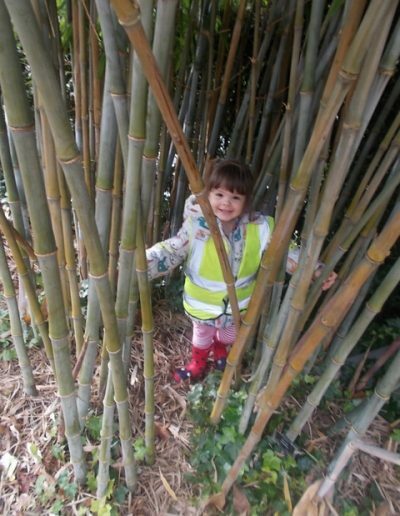 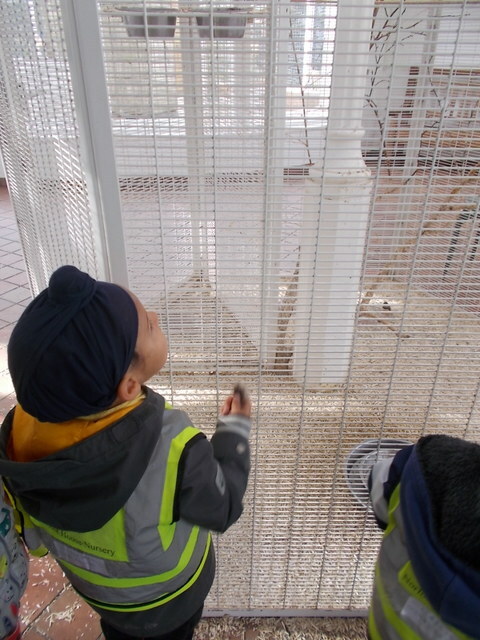 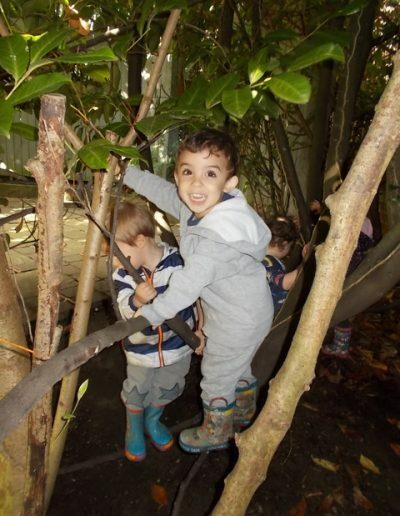 The children had lots of fun visiting Botanical Gardens. 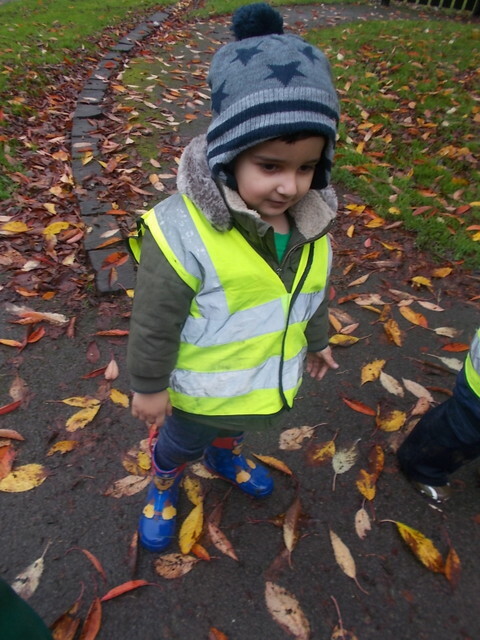 They explored in the leaves, enjoyed watching the birds and had lots of fun playing on the park. 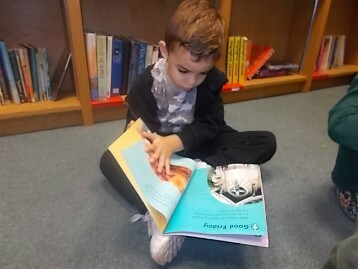 The children really enjoyed visiting the Library. 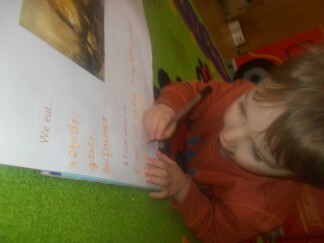 We read lots of different stories both individually and in small groups. 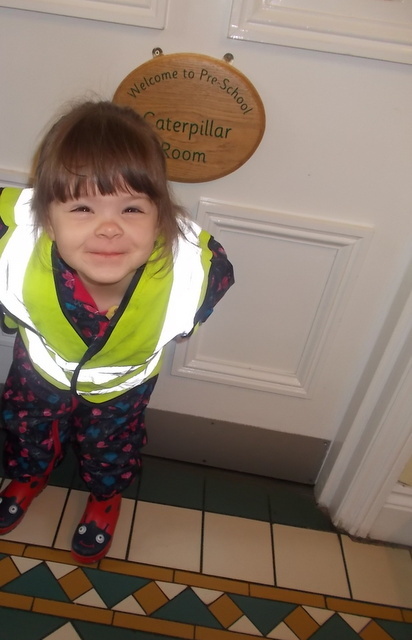 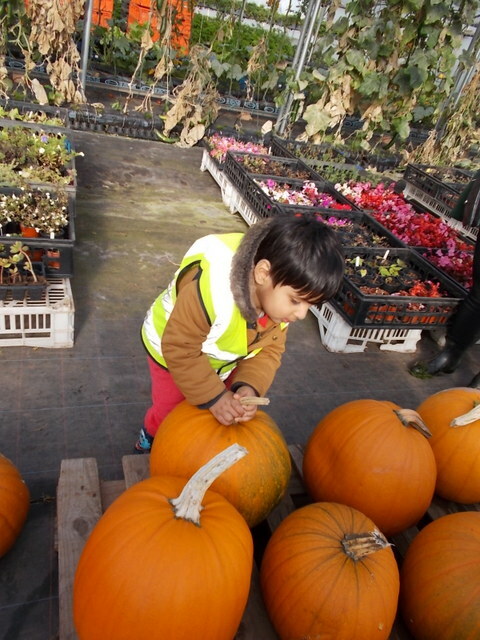 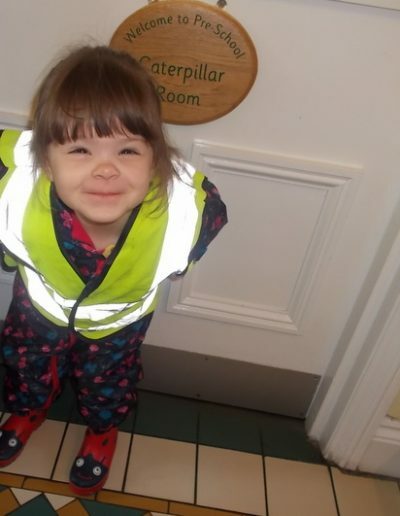 Toddlers loved going to Stanleys Farm Shop on the coach. 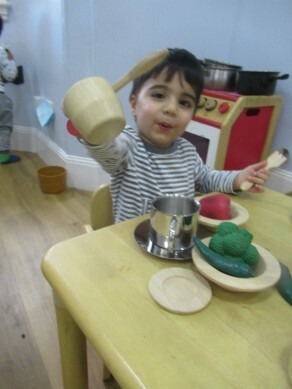 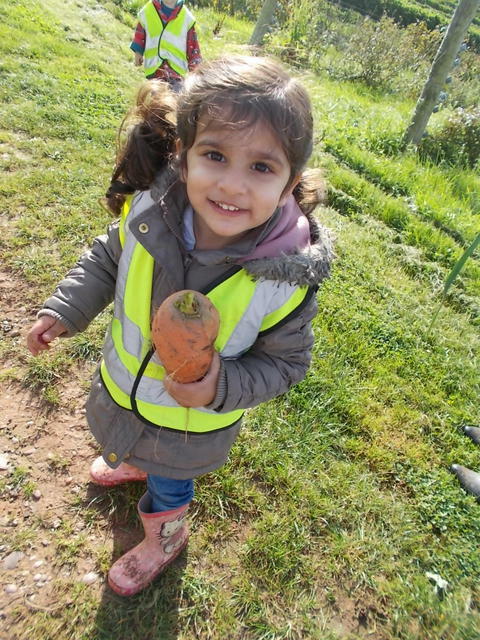 They explored all the different fruits and vegetables and then took part in some cooking activities on their return to nursery. 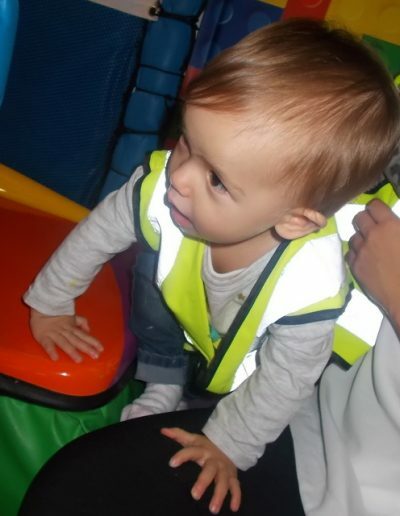 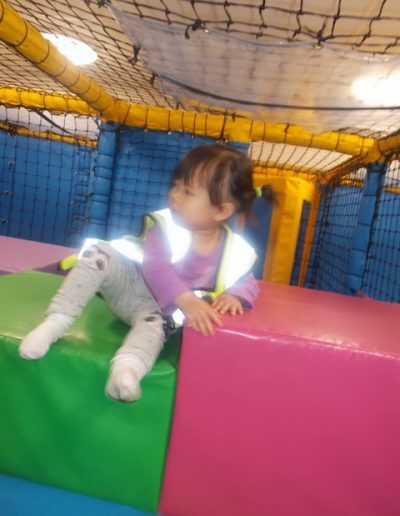 Babies had lots of fun exploring the Soft Play. 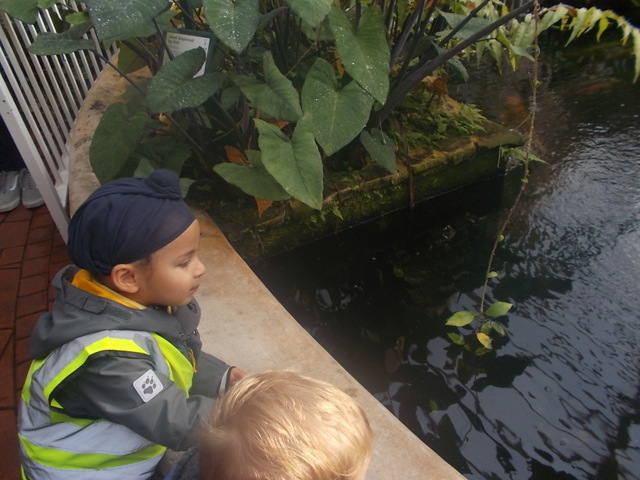 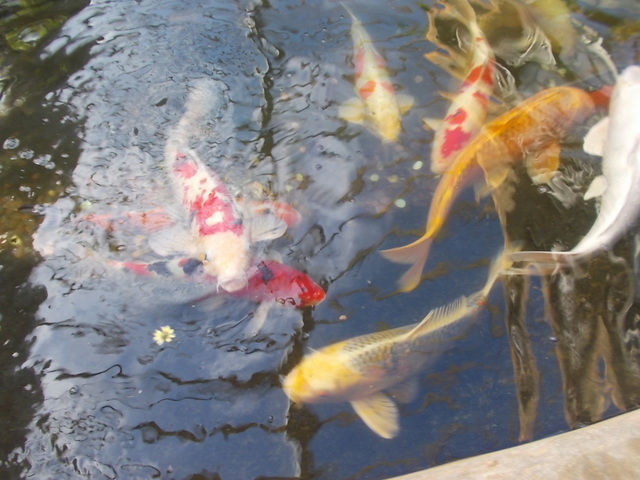 The children had lots of fun exploring the pond. 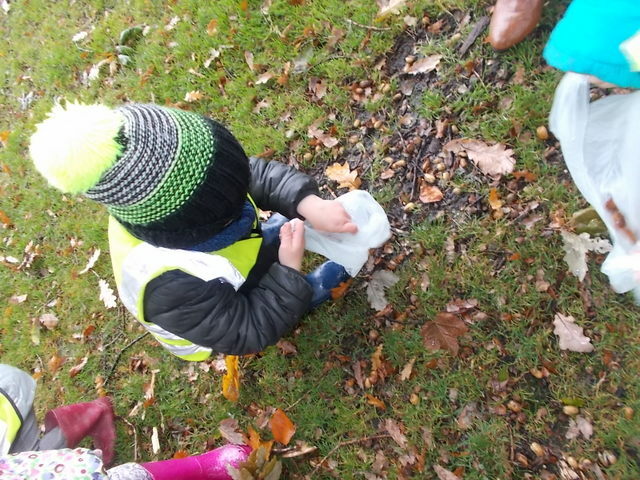 They used small nets to do some pond dipping. 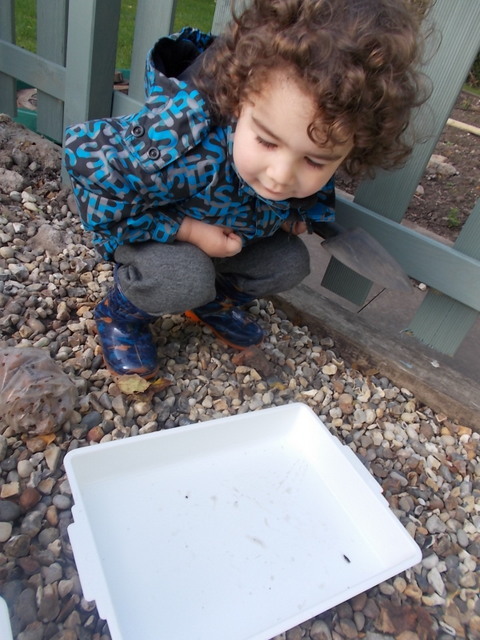 They put the different things in the pond trays to explore. Toddlers had lots of fun going on a ‘Gruffalo’ hunt in the woods. They explored the natural environment and also played in the park. 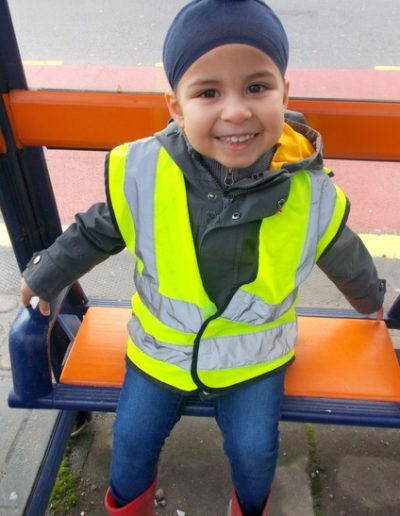 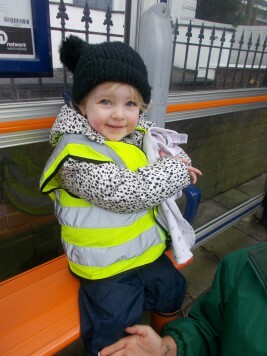 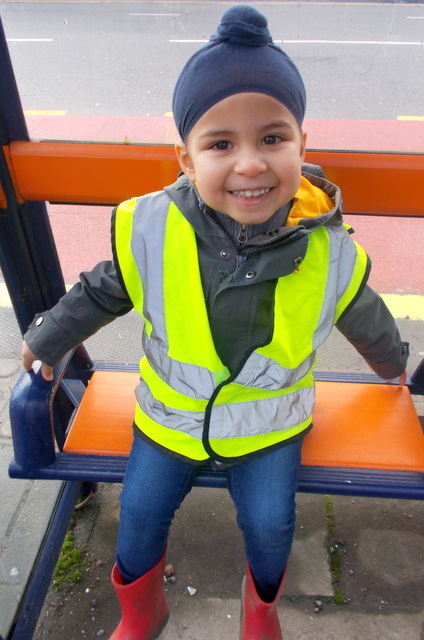 Pre-school had lots of fun travelling by bus to go to the park. They collected lots of natural resources to use when they returned to nursery. 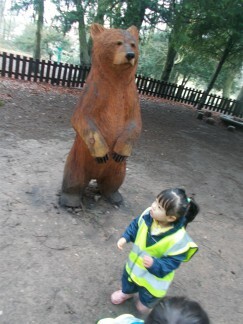 They played in the park and even tried to catch a Squirrel! Babies went on a trip to Botanical Gardens, they had fun exploring the swings and looking at the birds. 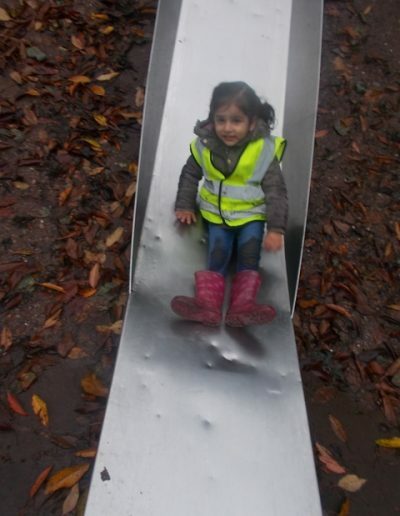 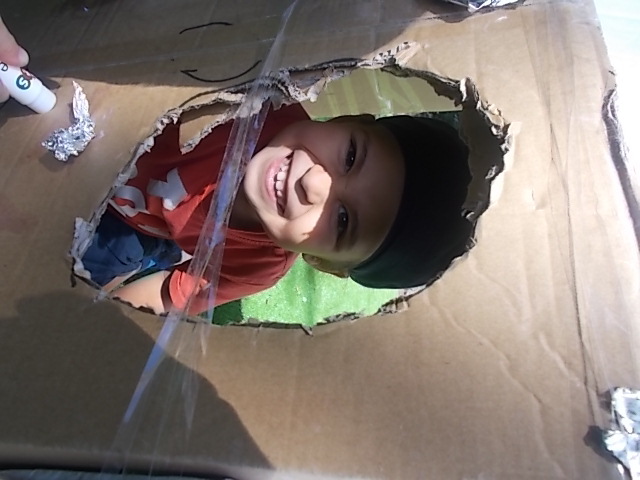 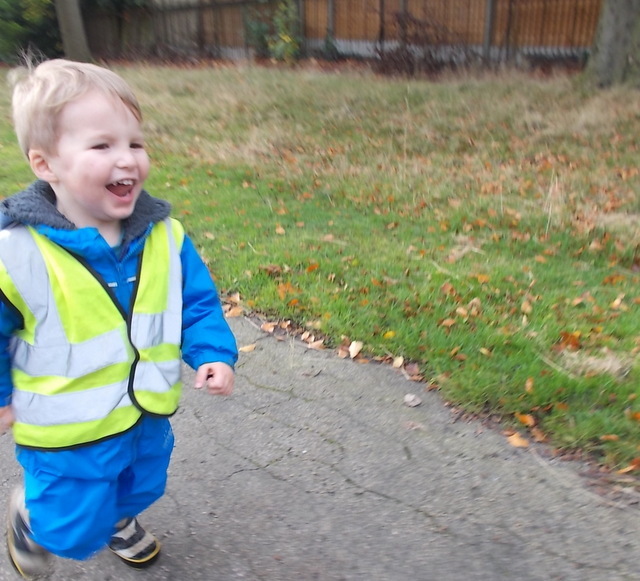 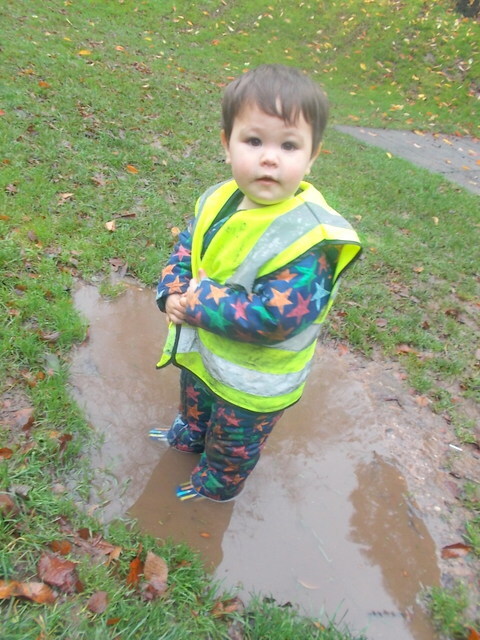 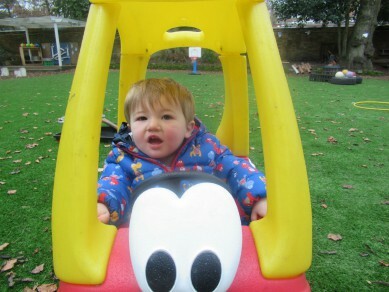 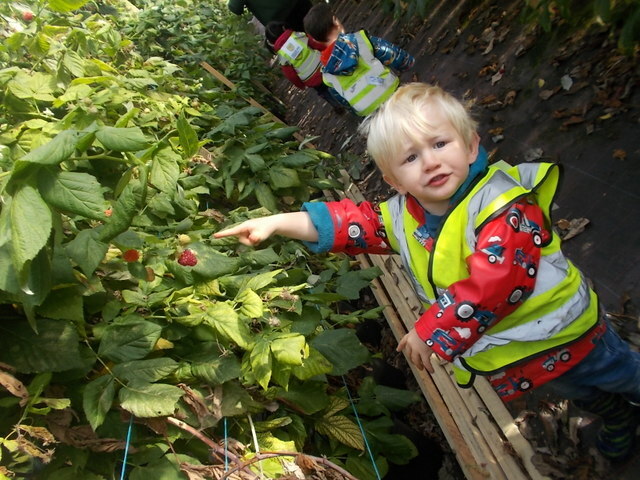 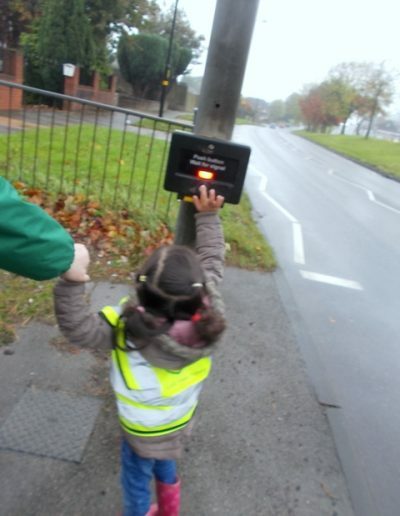 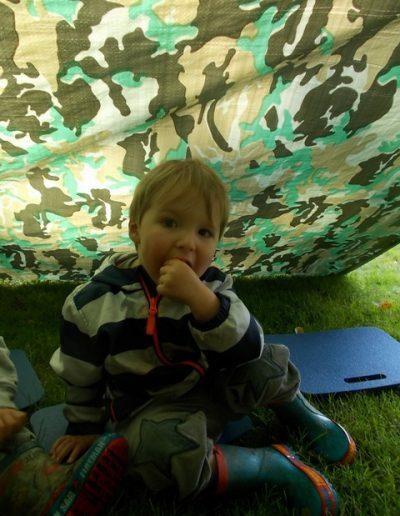 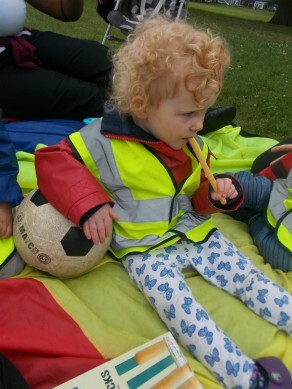 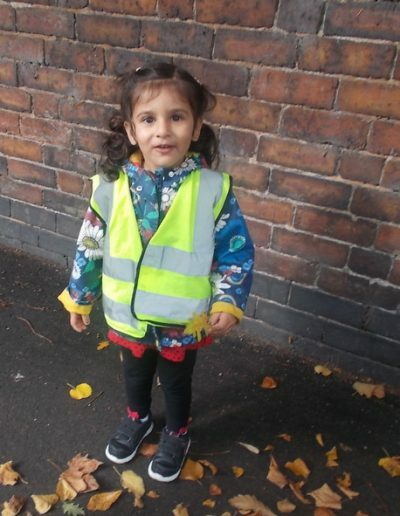 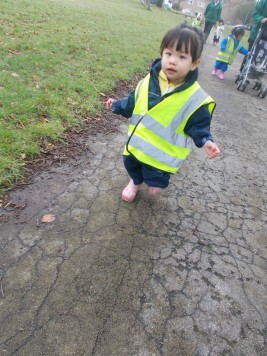 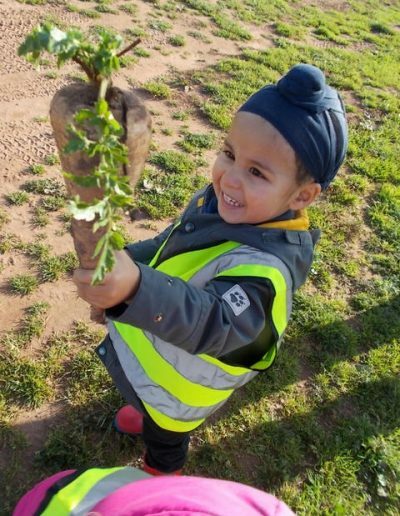 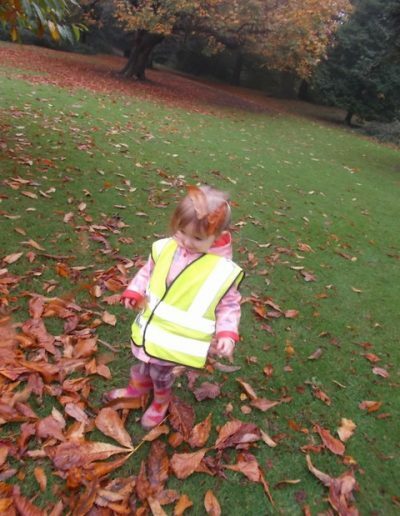 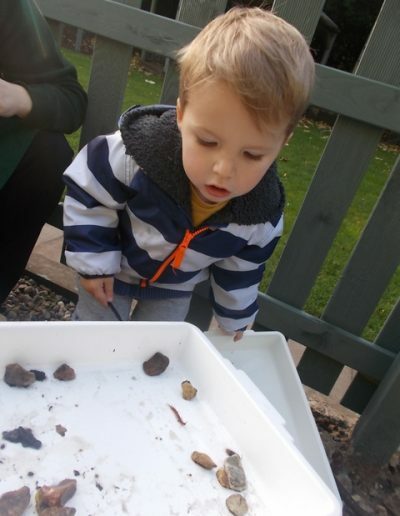 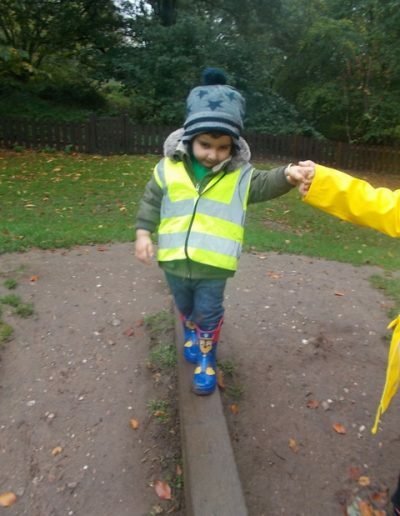 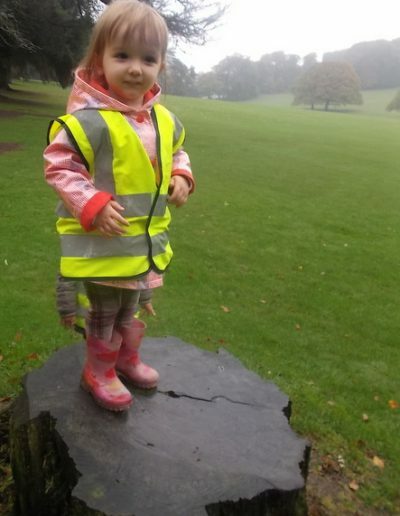 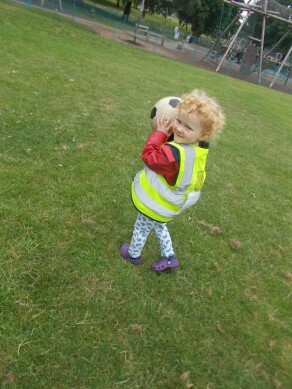 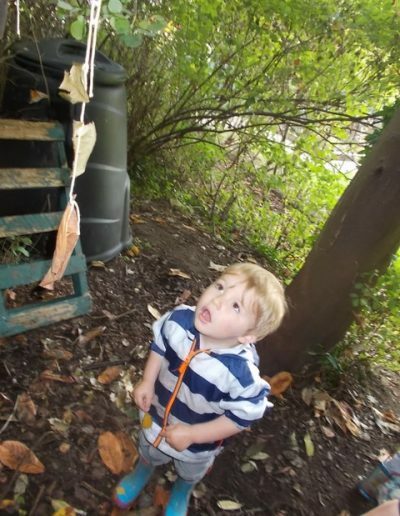 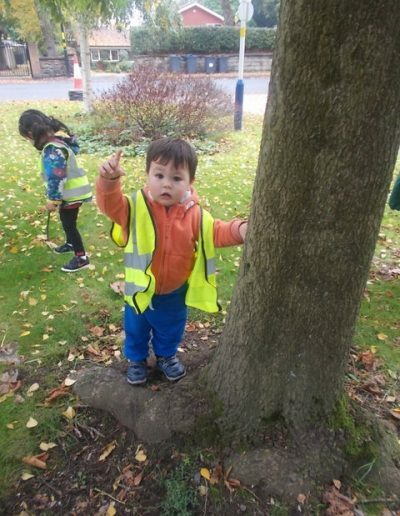 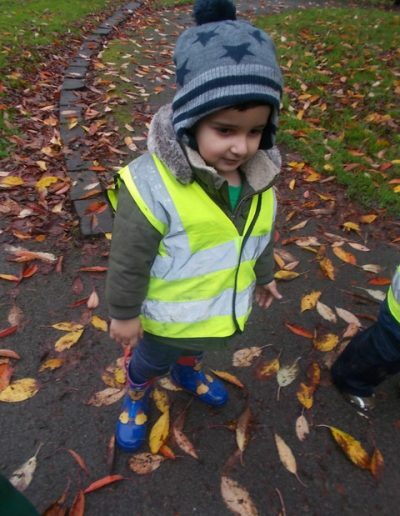 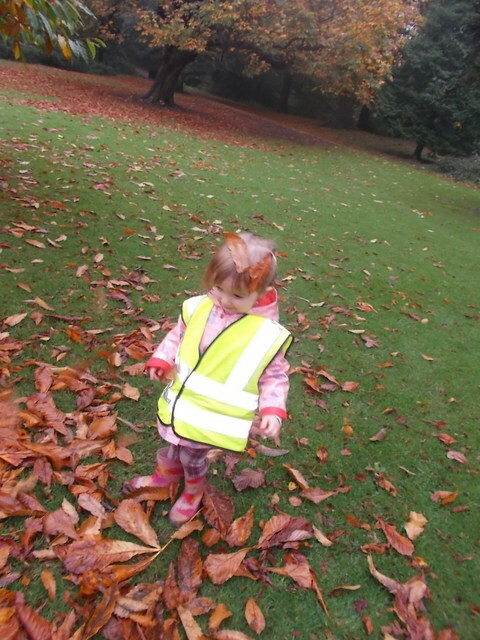 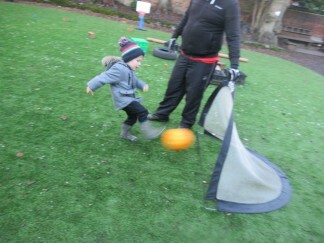 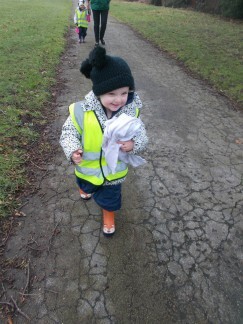 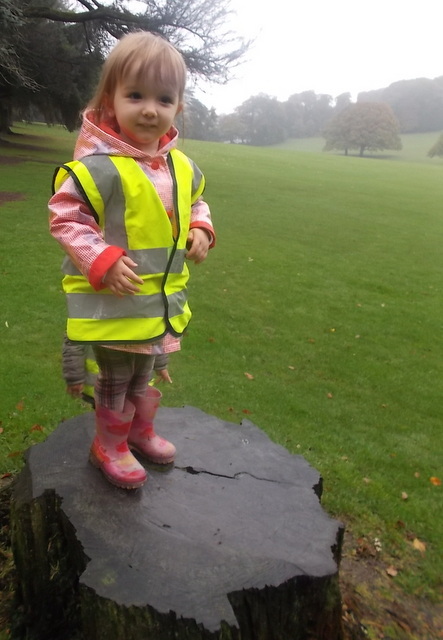 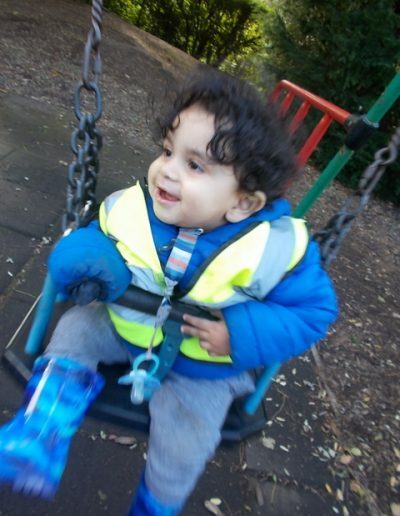 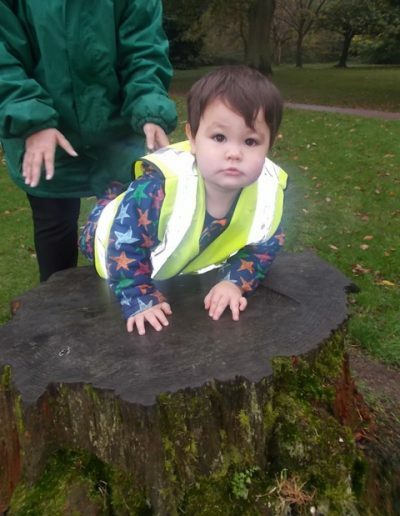 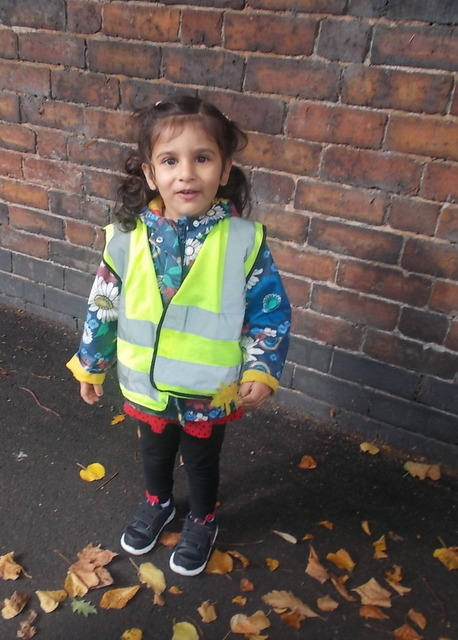 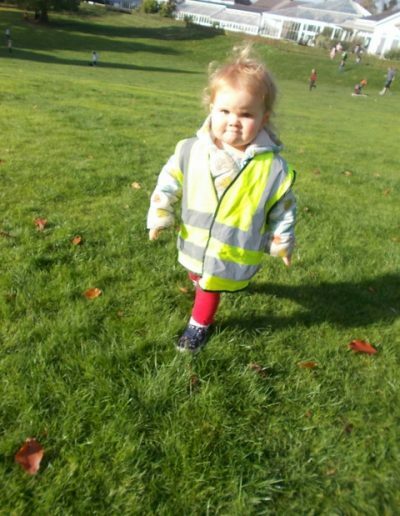 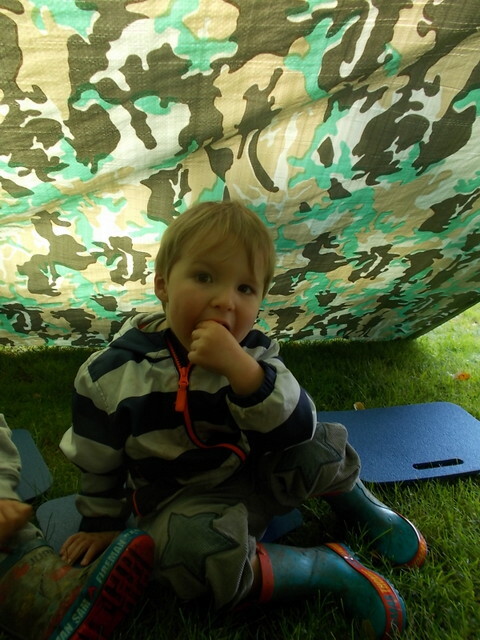 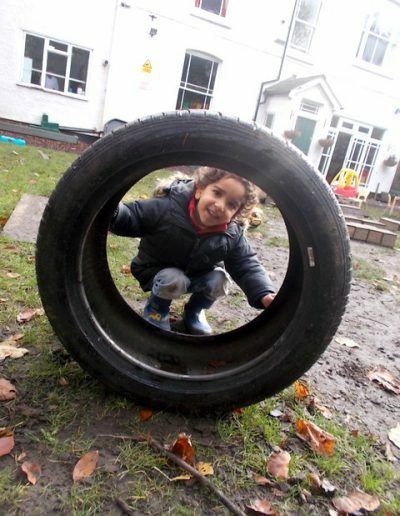 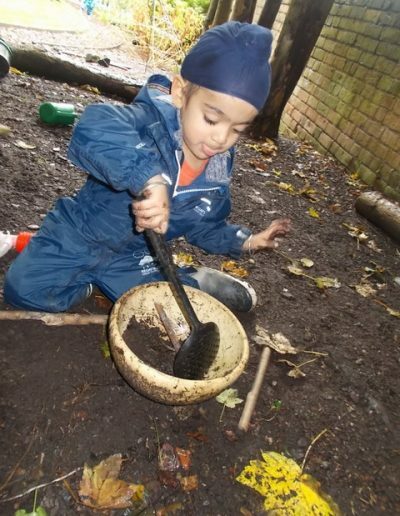 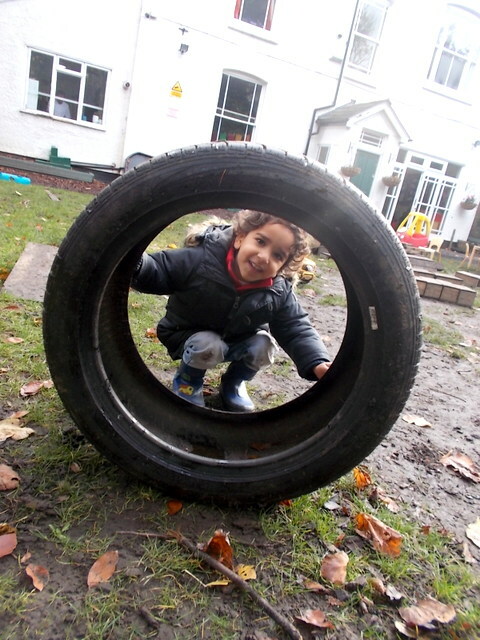 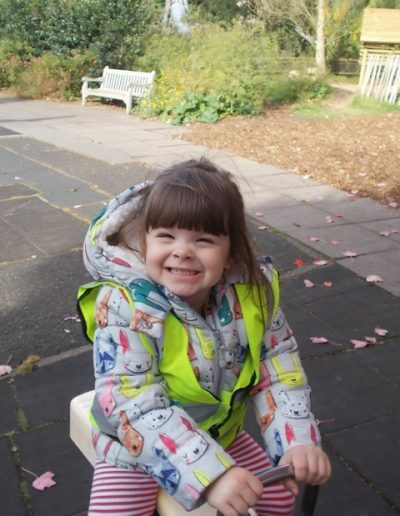 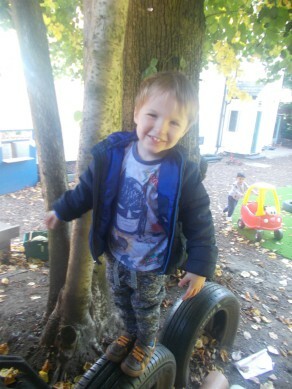 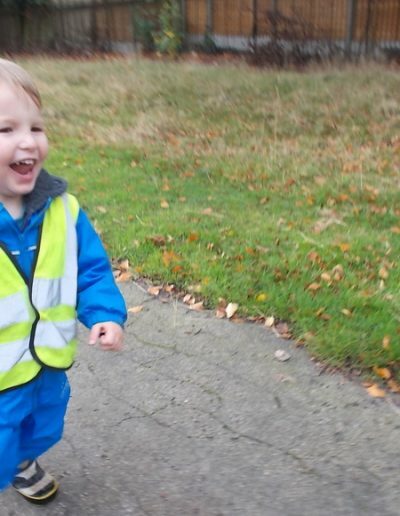 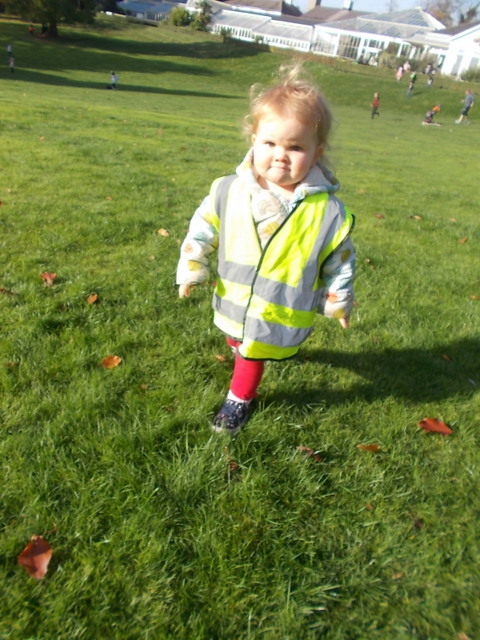 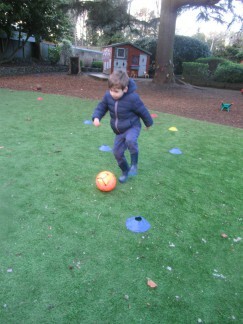 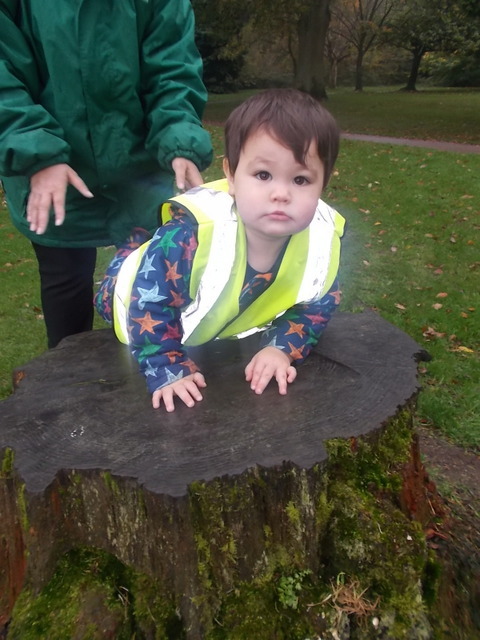 Toddlers had lots of fun exploring different ways of moving outdoors. 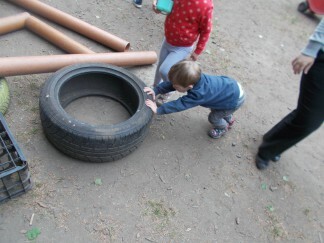 They created an obstacle course and moved in different ways to get to the end of it. 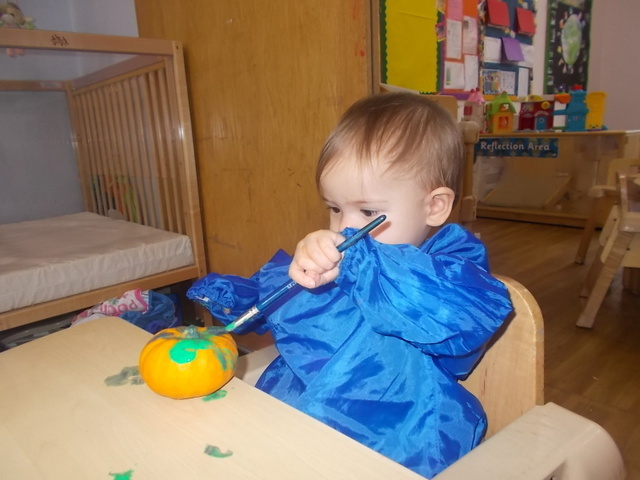 Babies have been making marks by decorating their own little pumpkins! 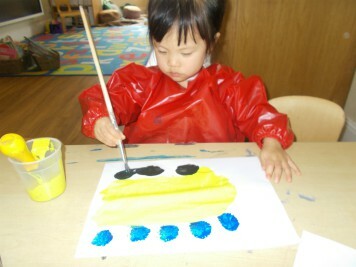 They used a paintbrush and paint to make their own marks on the pumpkin. 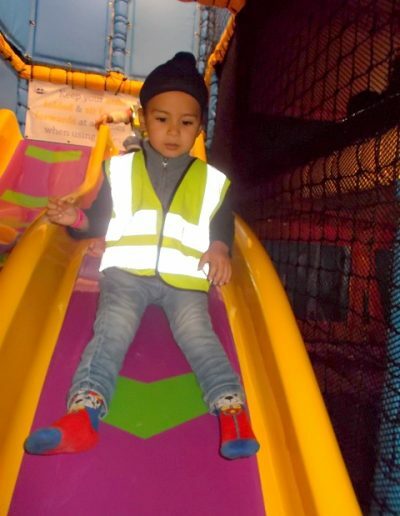 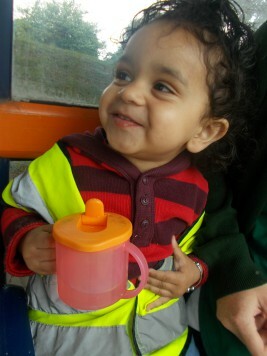 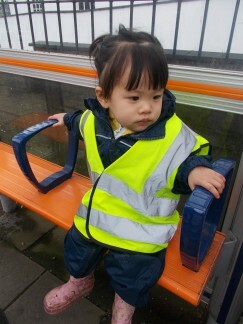 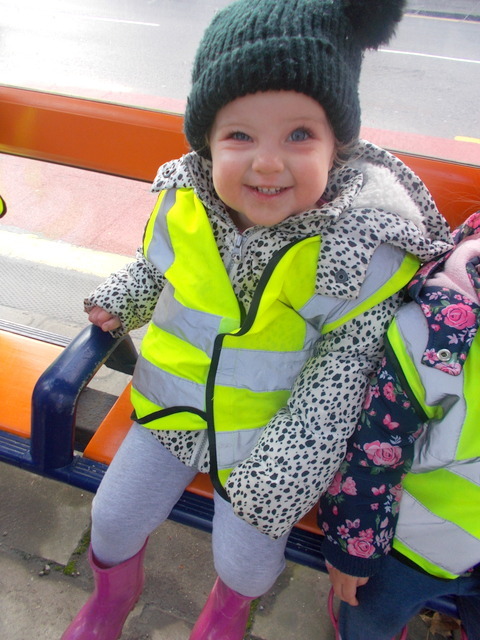 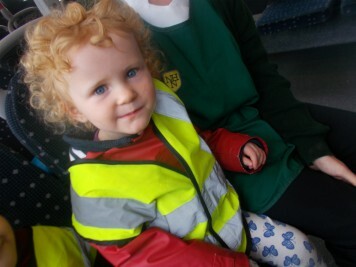 Our younger babies had lots of fun travelling on the bus to get to Soft Play. 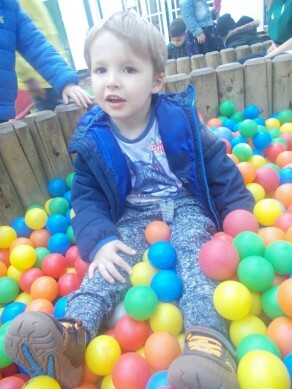 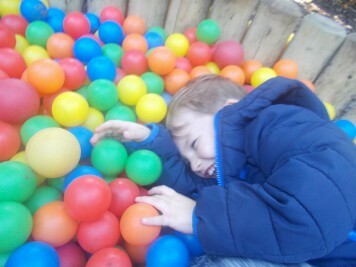 They climbed and explored the ball pits and had lots of fun! 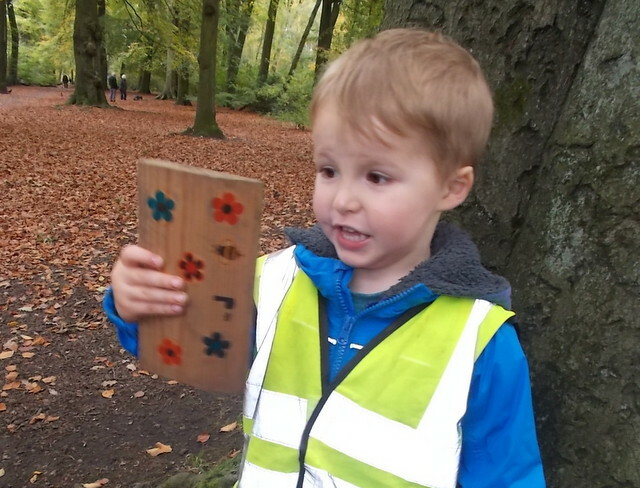 Toddlers made some lovely fairy doors to go and place in the woods. They put them at the bottom of the trees and are looking forward to going back to visit their new fairy friends! 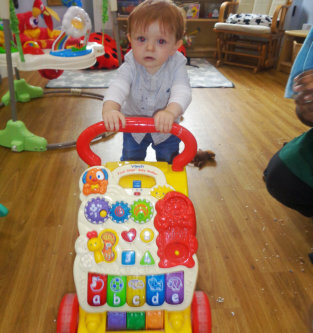 The younger babies have been practicing their walking using the walker toys. 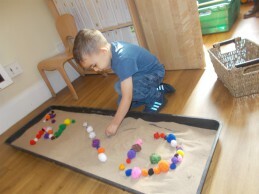 We have been exploring emotions and talking about what makes us feel certain ways. 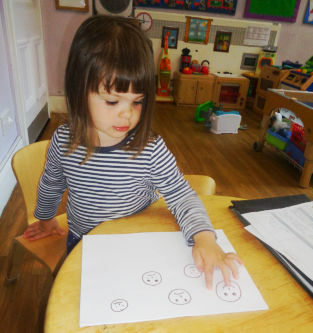 We used our gross motor skills to draw circles and imitate drawing our own faces.